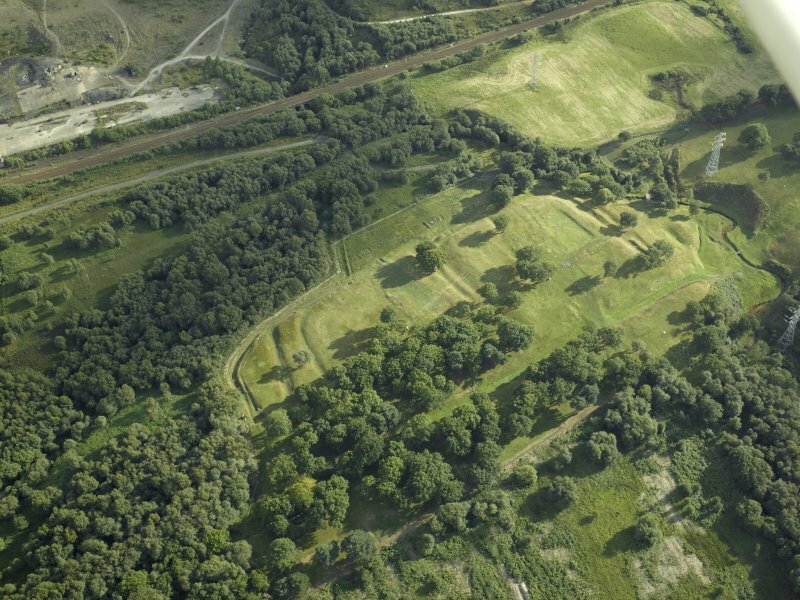 Aerial view of Rough Castle, the Antonine Wall and a field system, taken from the W.
Oblique aerial view of Rough Castle centred on the remains of the Antonine wall and a Roman fort, taken from the WSW. 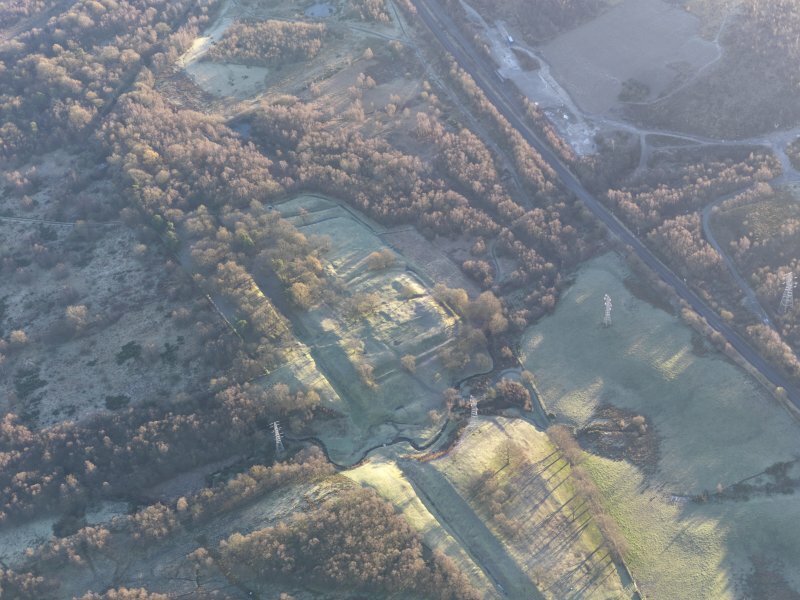 Aerial view of Rough Castle, the Antonine Wall and a field system, taken from the N.
Oblique aerial view of Rough Castle centred on the remains of a Roman fort and the Antonine wall, taken from the SSW. 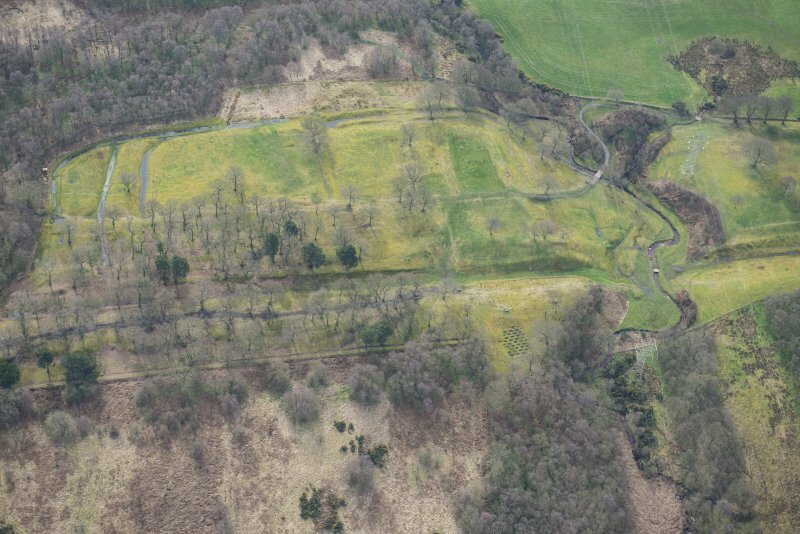 Oblique aerial view of Rough Castle centred on the remains of a Roman fort and the Antonine wall, taken from the W.
Oblique aerial view of Rough Castle centred on the remains of a Roman fort and the Antonine wall, taken from the WNW. 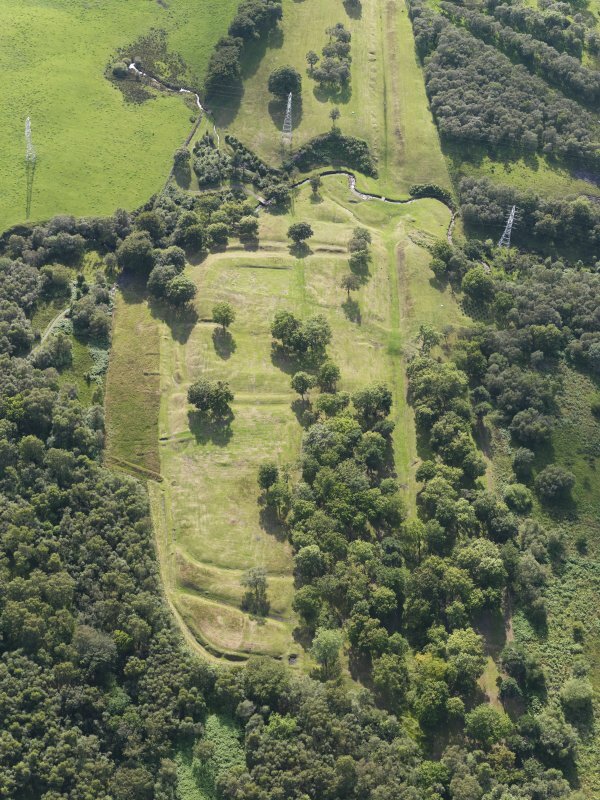 Oblique aerial view of Rough Castle Roman Fort and the Antonine Wall, looking ENE. 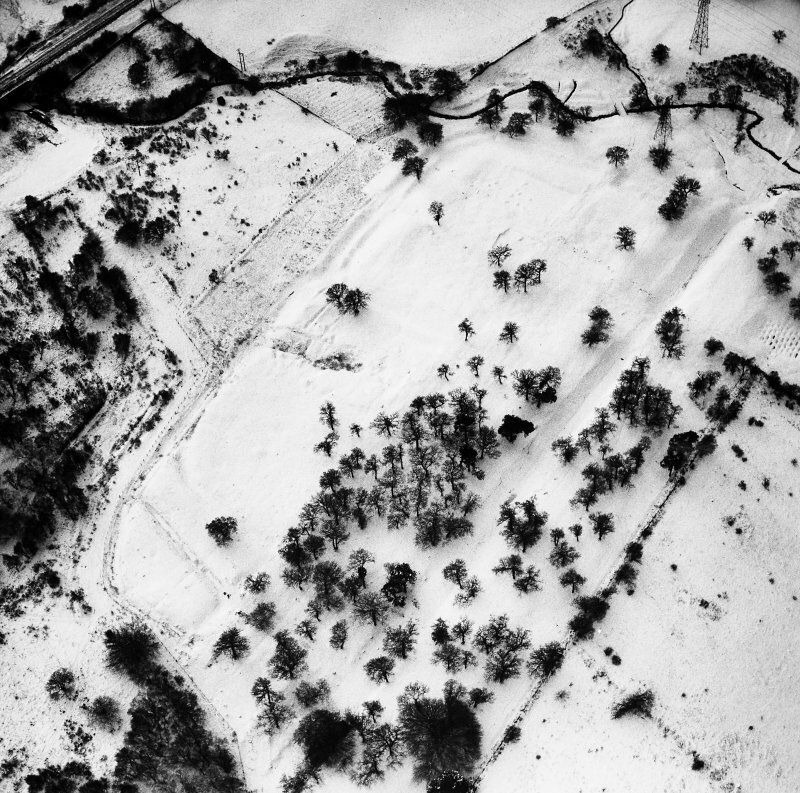 Oblique aerial view of Rough Castle Roman Fort and the Antonine Wall, looking ESE. 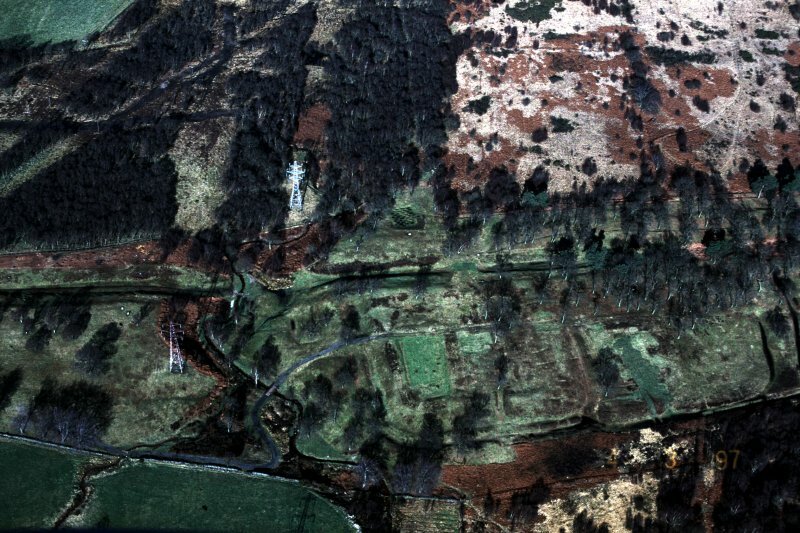 Oblique aerial view centred on the remains of Rough Castle Roman fort and the course of the Antonine Wall, taken from the WSW. 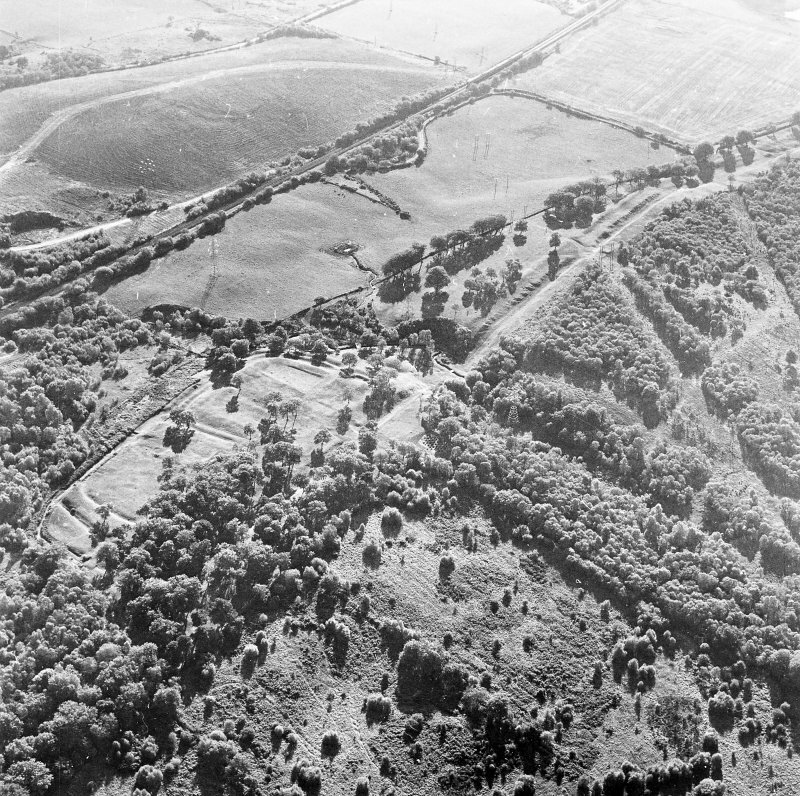 Oblique aerial view centred on the remains of the Roman fort and the course of the Antonine Wall, taken from the SE. 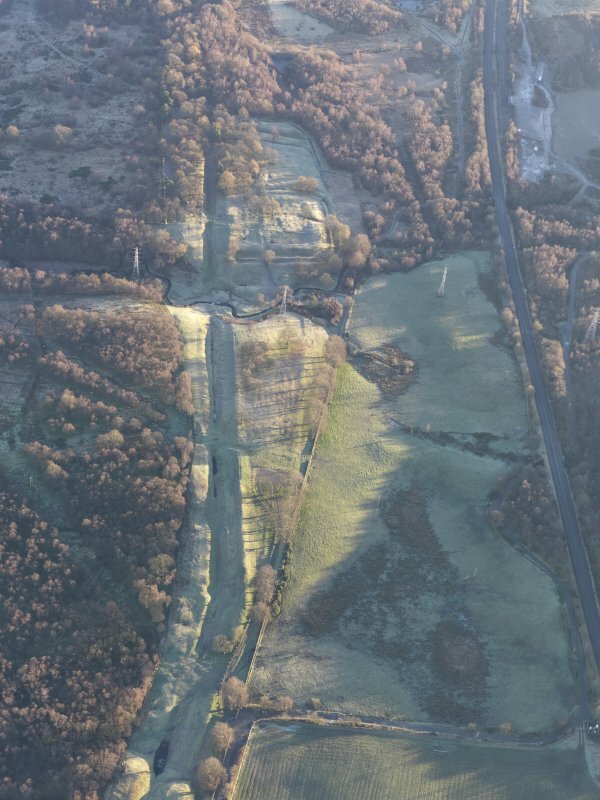 Oblique aerial view centred on the remains of the Roman fort and the course of the Antonine Wall, taken from the SW.
Oblique aerial view centred on the remains of the Roman fort and the course of the Antonine Wall, taken from the NNE. 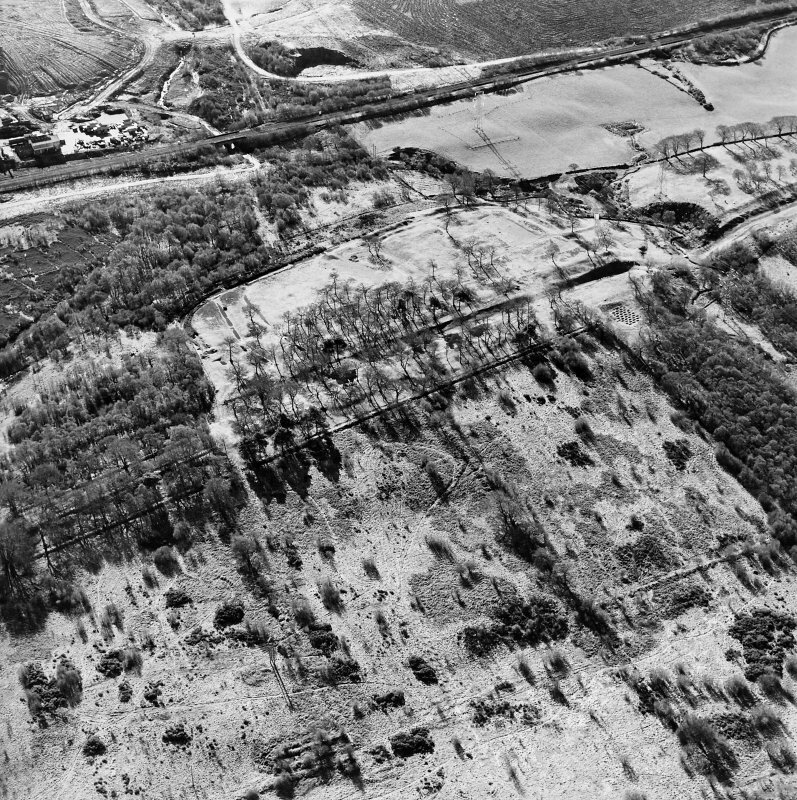 Oblique aerial view of Rough Castle, the Antonine Wall and a field system, from the N.
Aerial view of Rough Castle, the Antonine Wall, excavated lilia and field system, taken from the N.
Oblique aerial view of the Antonine Wall (NS c.836 798), taken from the W.
Oblique aerial view of Rough Castle, the Antonine Wall and a field system, taken form the S.
Aerial view of the Antonine Wall (c. 836 798), including the western edge of Rough Castle, taken from the N.
Oblique aerial view of Rough Castle centred on the remains of the Antonine wall and a Roman fort, taken from the SW.
Oblique aerial view of Rough Castle centred on the remains of a Roman fort and the Antonine wall, taken from the NNW. 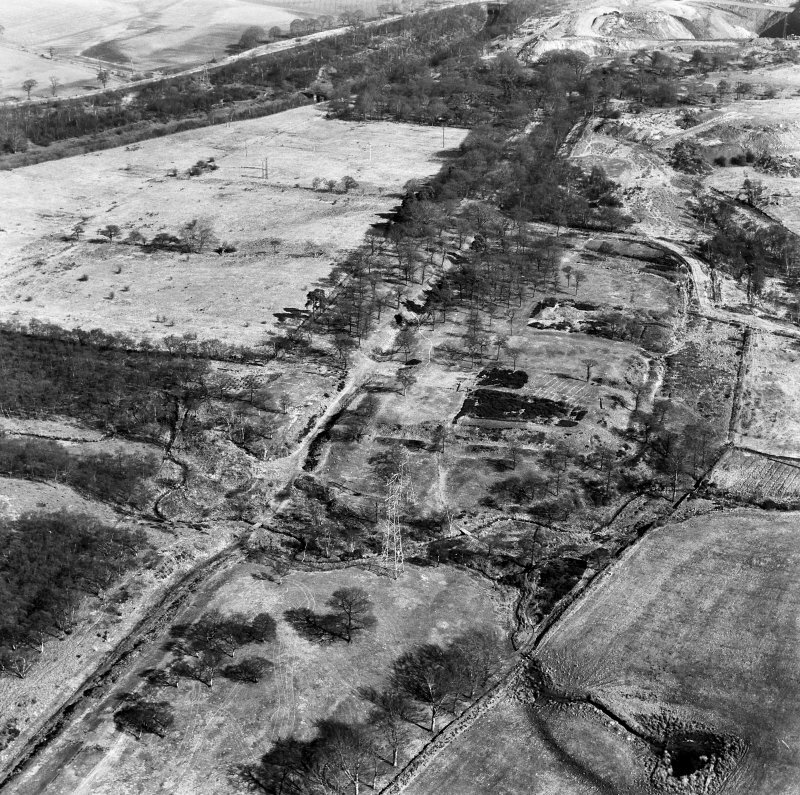 Oblique aerial view of Rough Castle centred on the remains of a Roman fort and the Antonine wall, taken from the N.
Aerial view of Rough Castle, the Antonine Wall, excavated lilia and field system, taken from the E.
Excavations at Rough Castle- Proceedings of the Society of Antiquaries of Scotland, May 8th 1905; Vol. XXXIX p. 442. 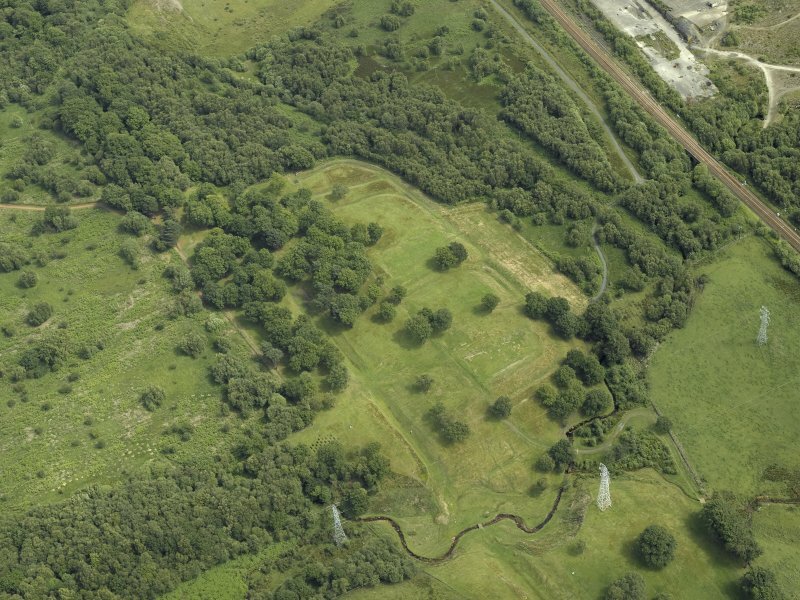 The Antonine Fort Junction of east rampart of the fort with the Antonine wall, looking east. 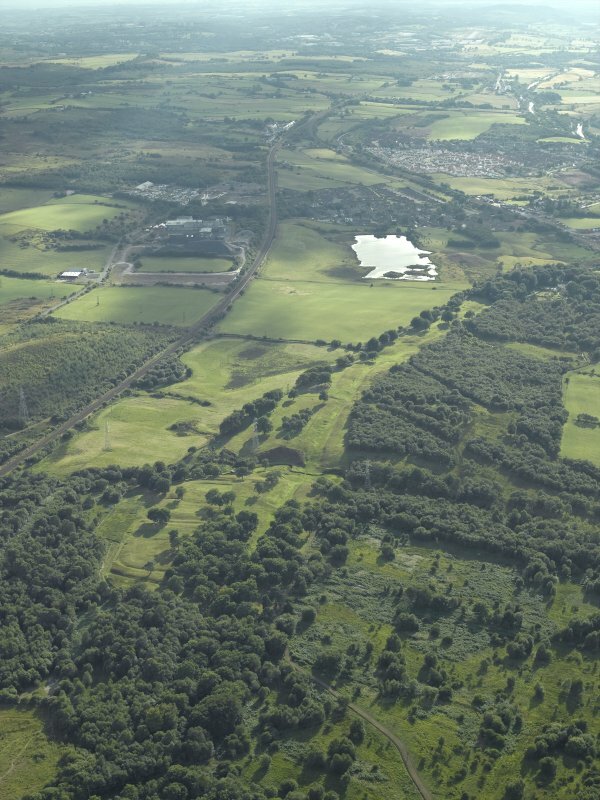 General oblique aerial view centred on the remains of the Roman fort and the course of the Antonine Wall, taken from the NNW. 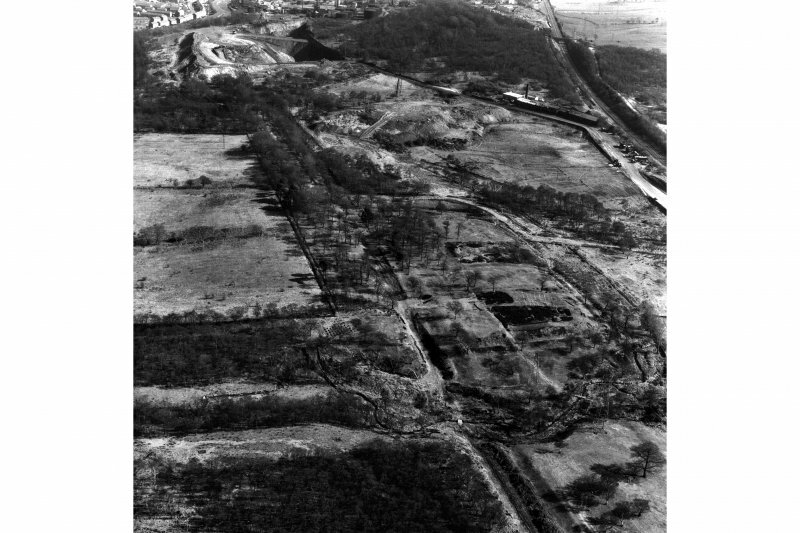 Aerial view along the Antonine Wall (c. 836 798) including Rough Castle, taken from the W.
Oblique aerial view of Rough Castle centred on the remains of a Roman fort and the Antonine wall, taken from the NNE. 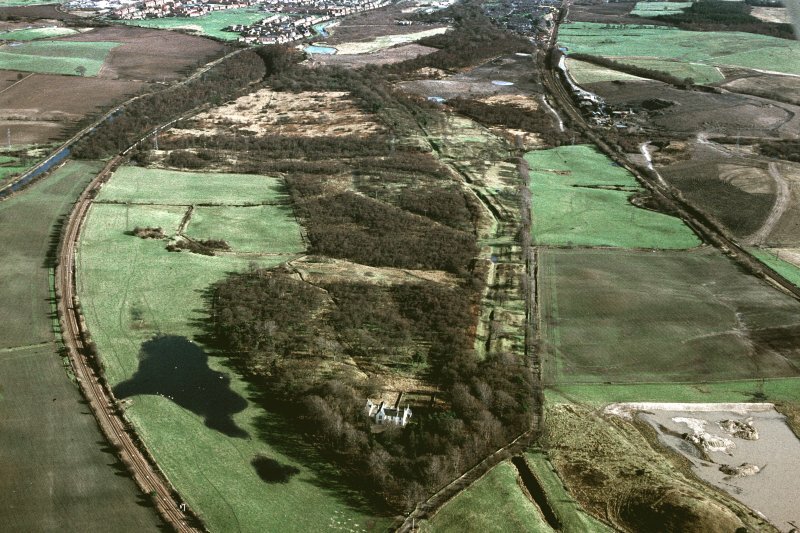 Oblique aerial view of Rough Castle centred on the remains of a Roman fort and the Antonine wall, taken from the NE. 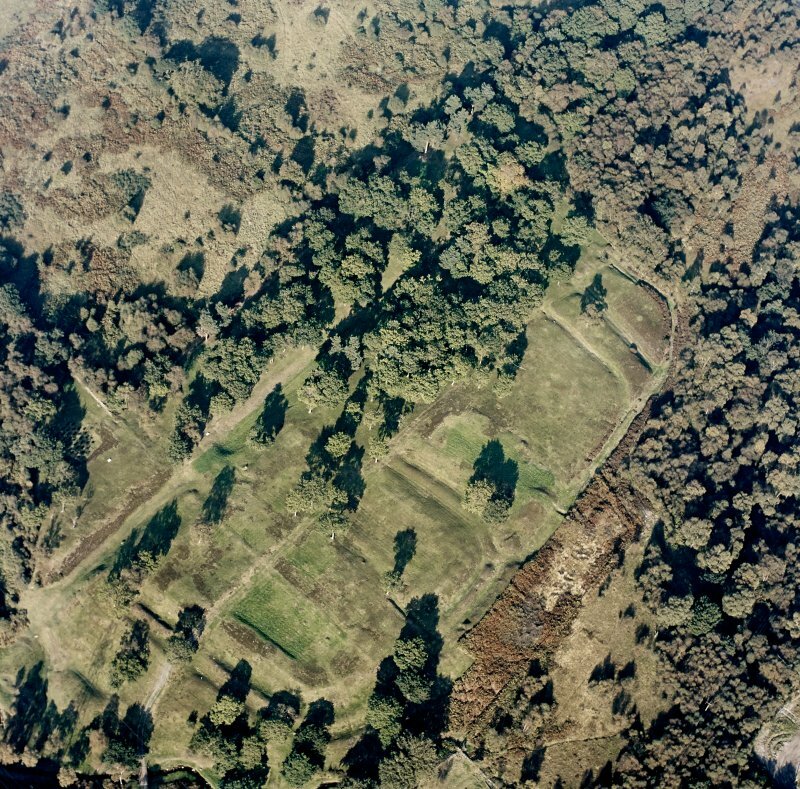 Oblique aerial view centred on the remains of the Roman Fort, taken from the WSW. 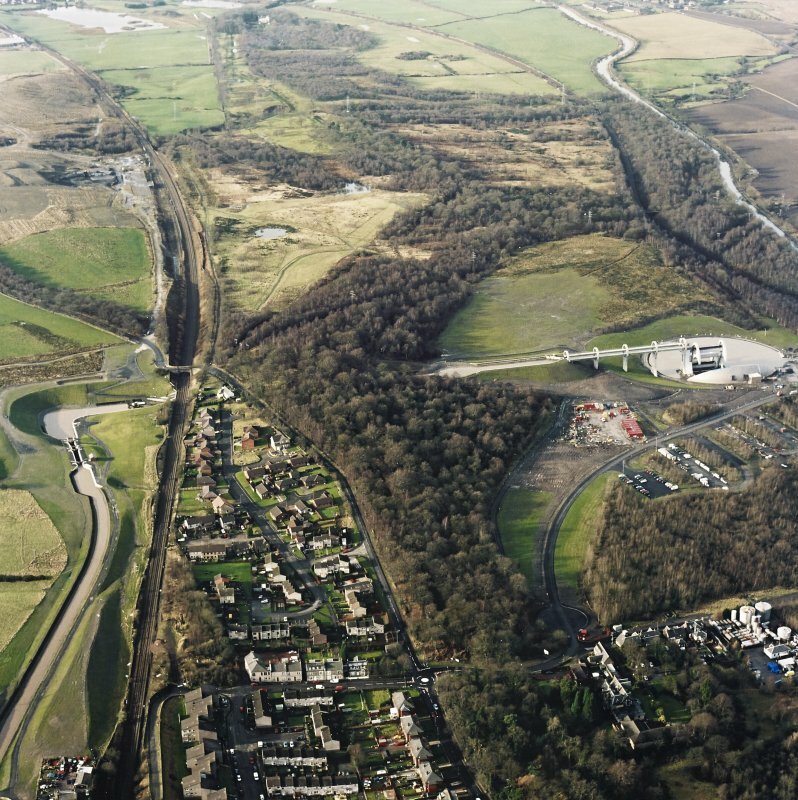 General oblique aerial view centred on the remains of the Roman fort and the course of the Antonine Wall, taken from the W.
Oblique aerial view centred on the remains of the Roman fort and the course of the Antonine Wall, taken from the NW. 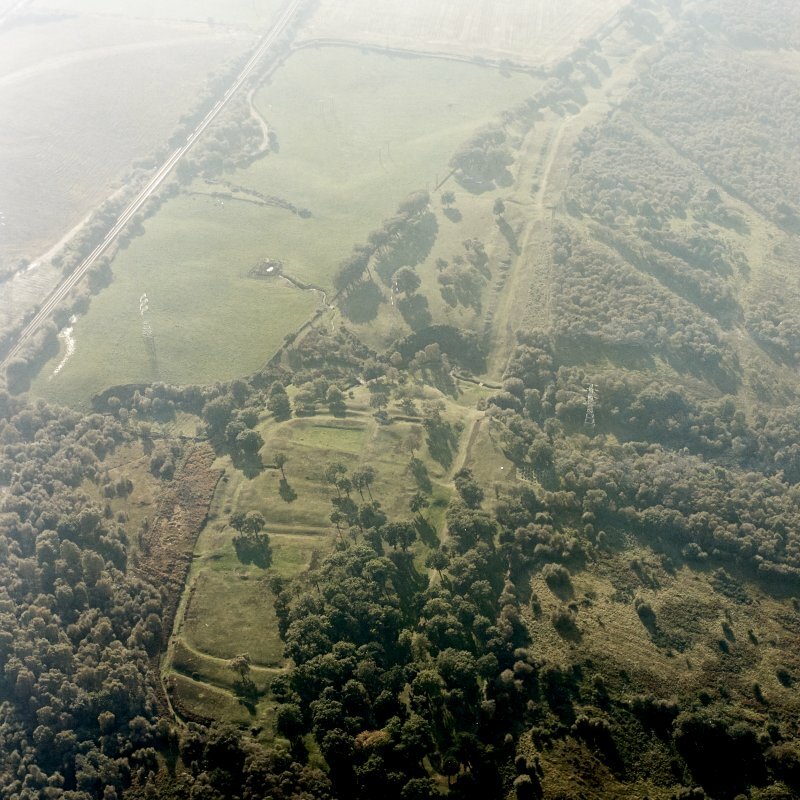 View of Rough Castle Roman Fort. 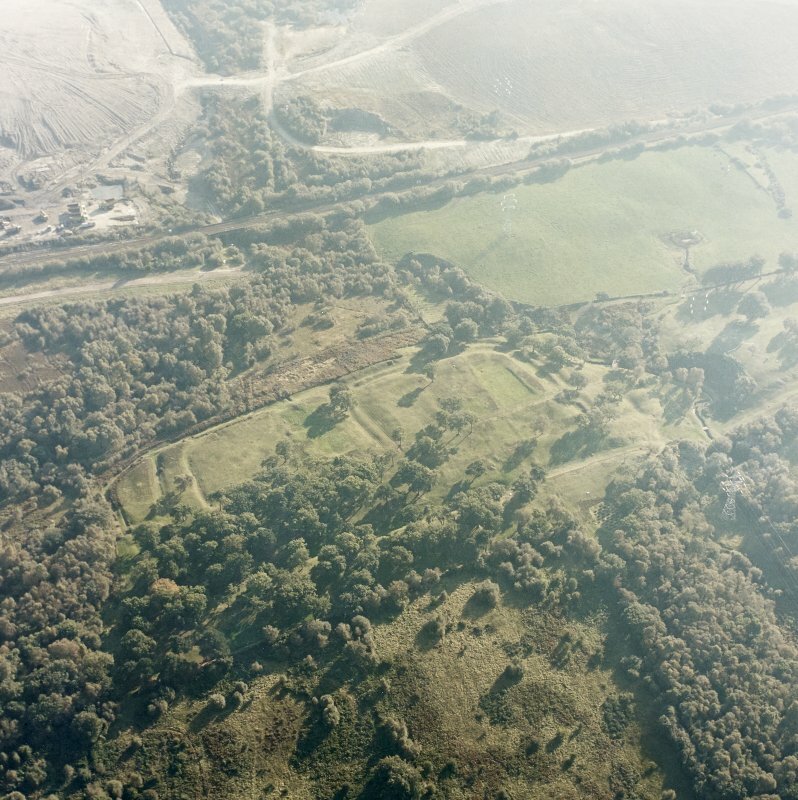 Aerial view of Rough Castle, the Antonine Wall and a field system, taken from the SW.
Aerial view of Rough Castle, the Antonine Wall and a field system, taken from the E.
Oblique aerial view of Rough Castle centred on the remains of a Roman fort and the Antonine wall, taken from the WSW. 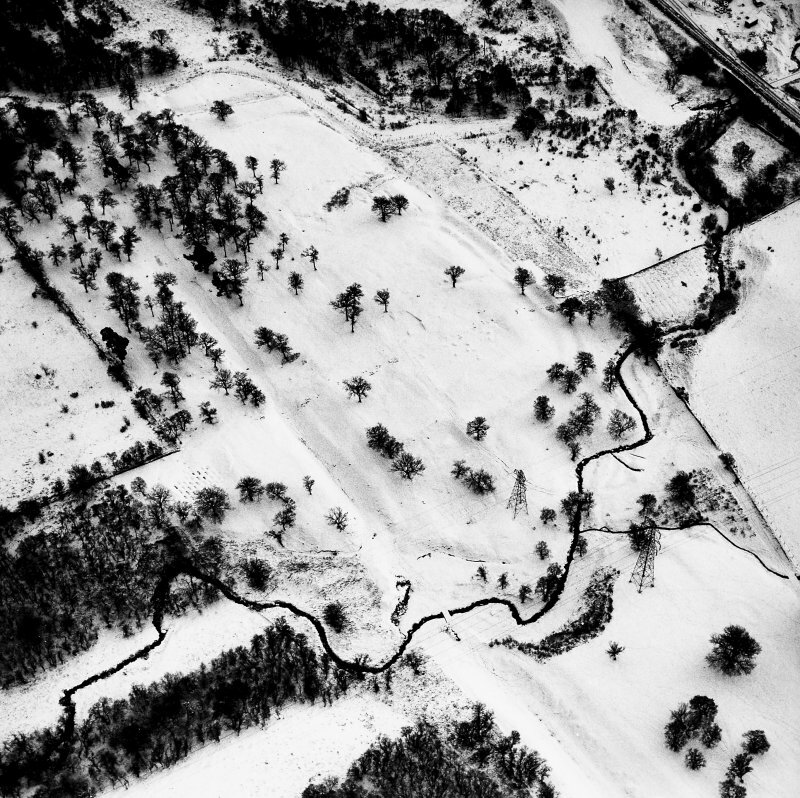 Rough Castle: aerial view under snow. 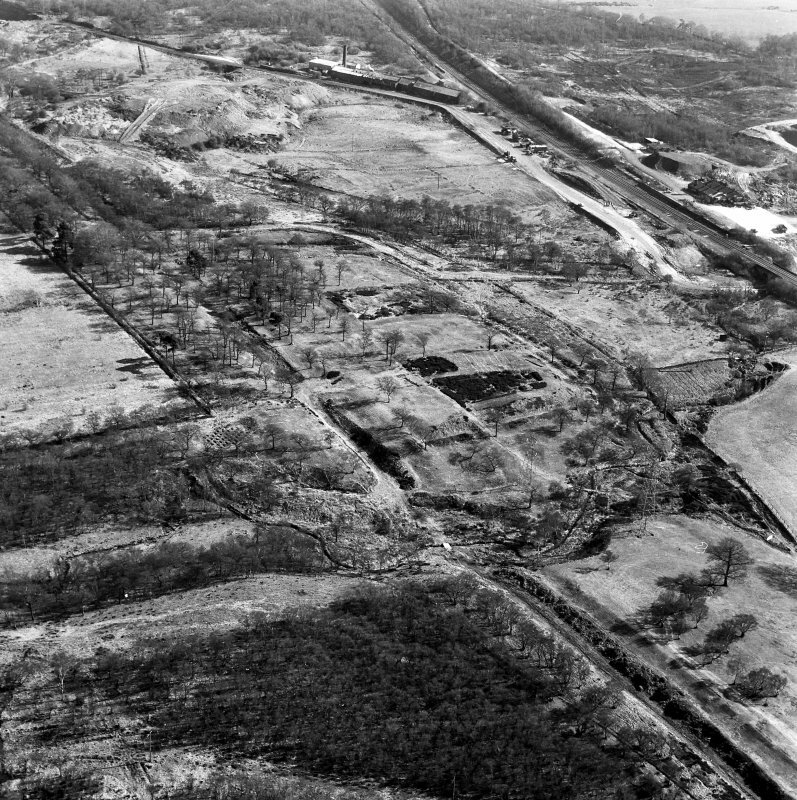 Oblique aerial view of the Falkirk Wheel, lock, and the remains of the Roman fort and Antonine Wall, taken from the E.
Rough Castle Roman Fort Excavation photograph - 1957/1959 West rampart section. 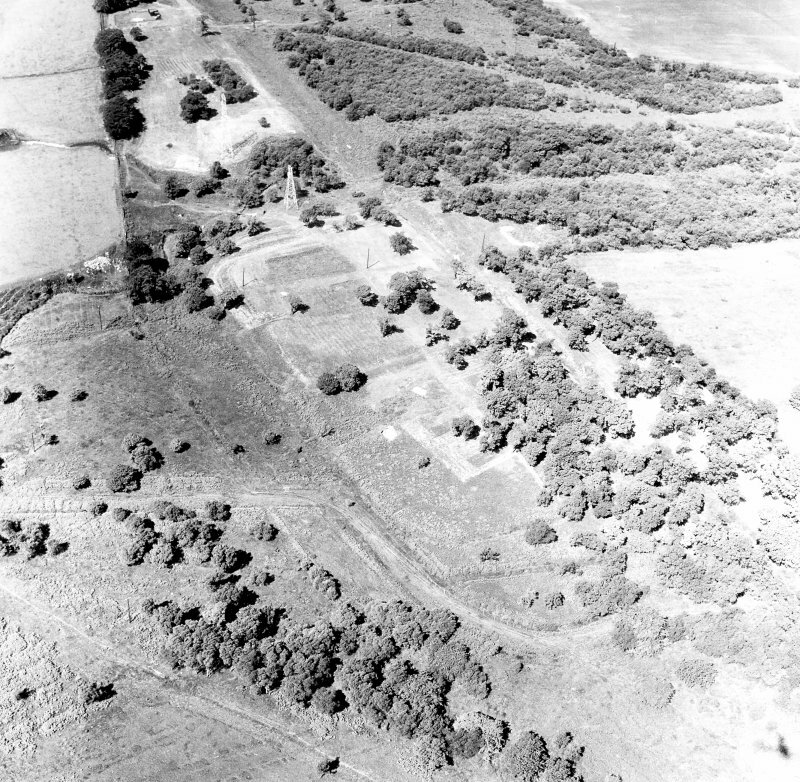 Oblique aerial view of Rough Castle, taken from the ENE. 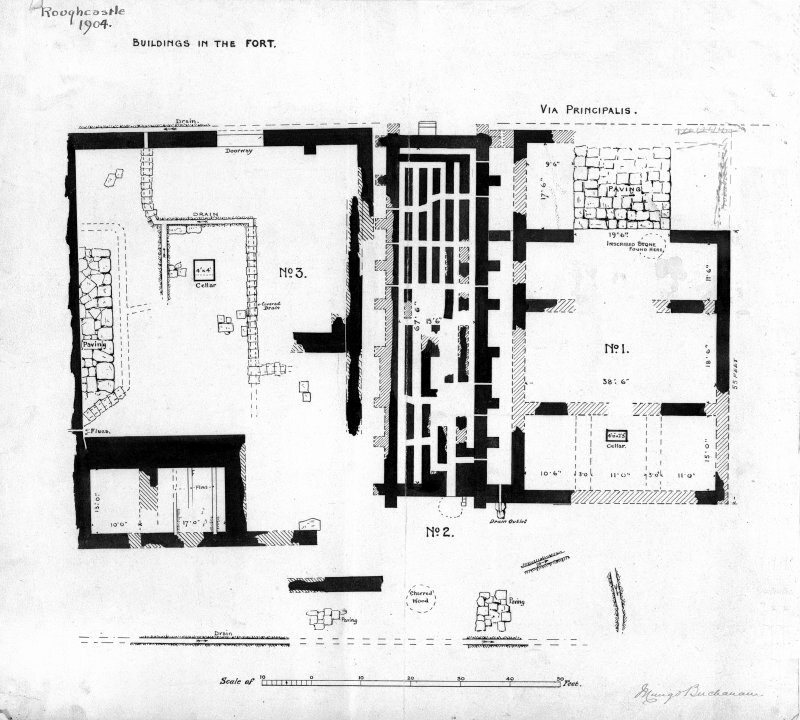 Excavations at Rough Castle- Proceedings of the Society of Antiquaries of Scotland, May 8th 1905; Vol. XXXIX p. 442. 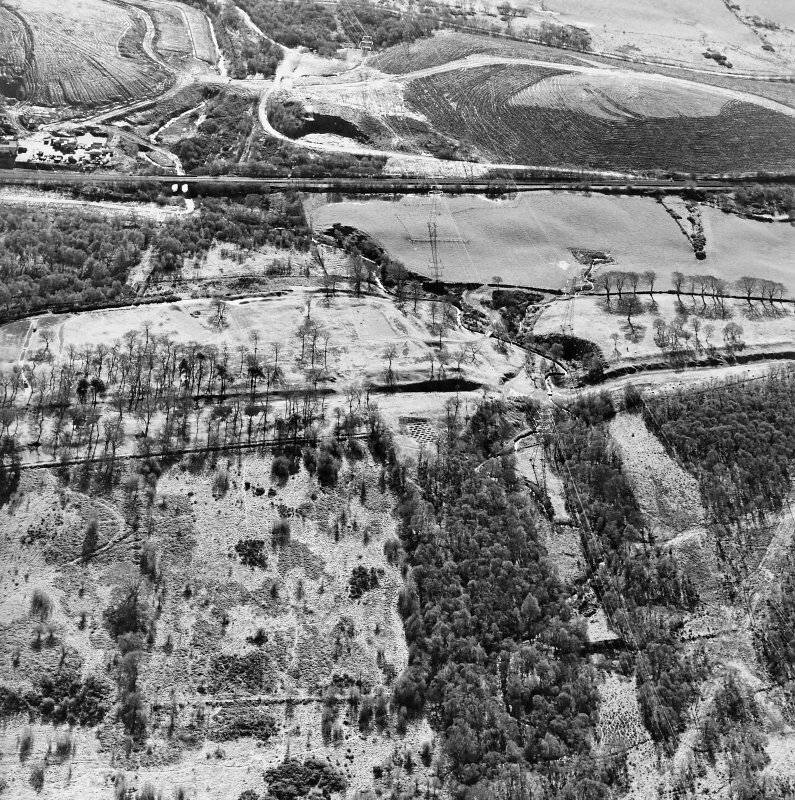 The Antonine Wall The Wall and Ditch excavated, looking west. 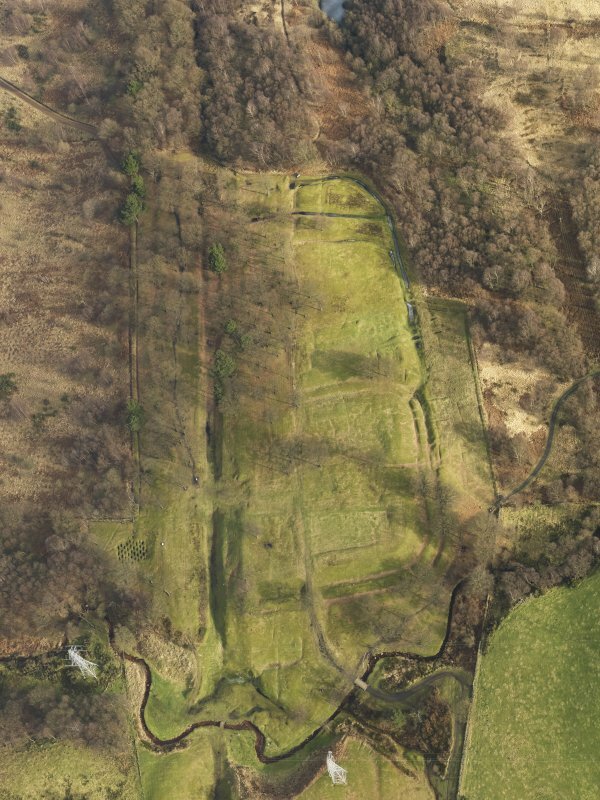 Oblique aerial view centred on the remains of the Roman Fort, taken from the SW.
Oblique aerial view centred on the remains of the Roman fort and the course of the Antonine Wall, taken from the SSE. 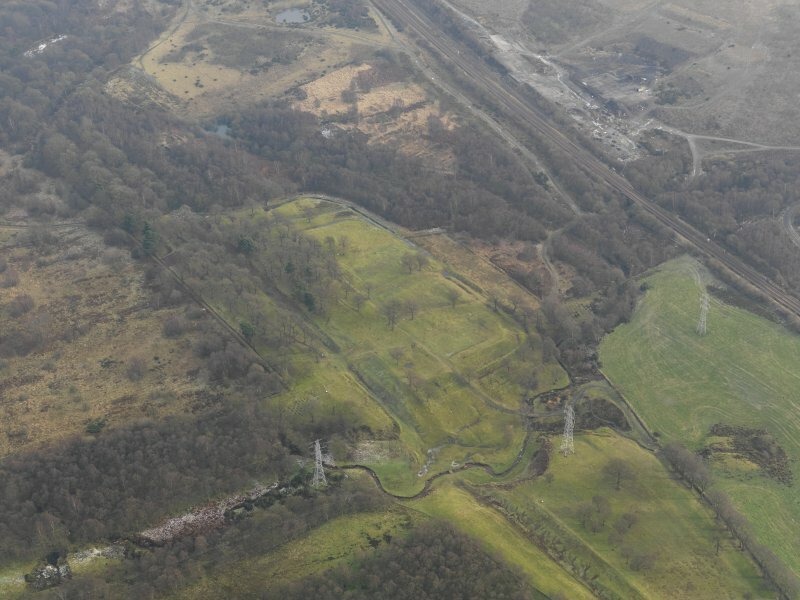 Oblique aerial view centred on the remains of the Roman fort and the course of the Antonine Wall, taken from the WSW. 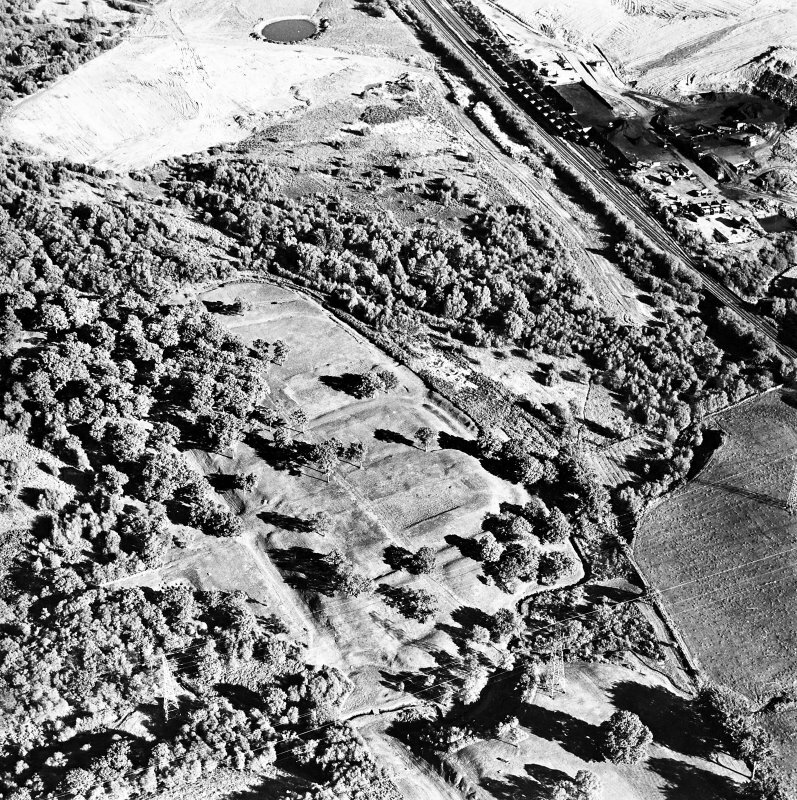 General oblique aerial view centred on the remains of the Roman fort and the course of the Antonine Wall, taken from the NE. 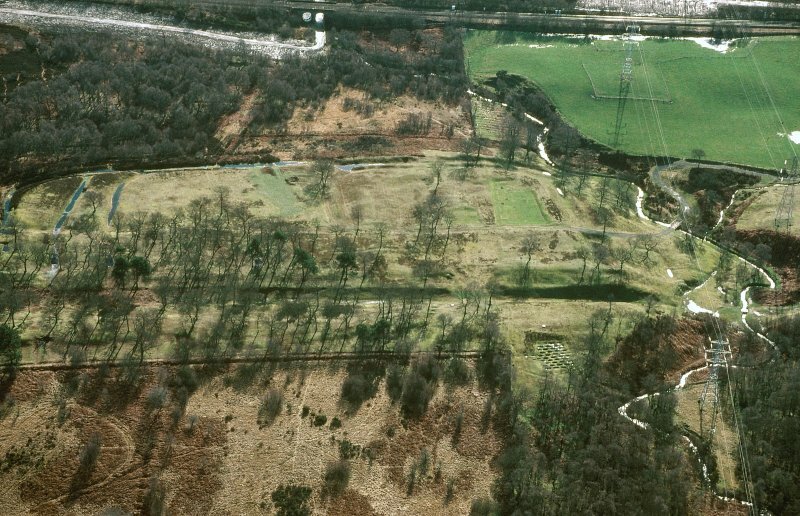 Oblique aerial view centred on the remains of the Roman fort and the course of the Antonine Wall, taken from the NE. For adjacent field-system, see NS87NW 12. See also NS87NW 32.00 and NS88SW 57. 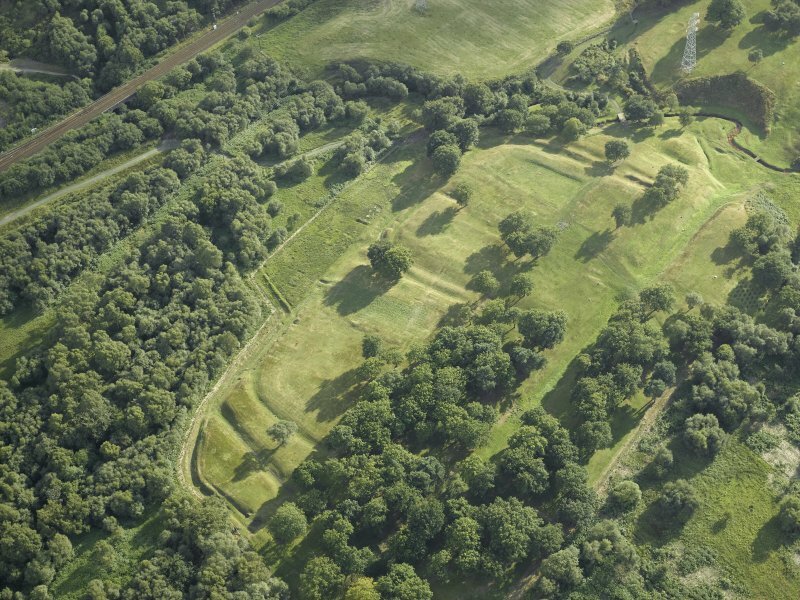 The fort at Rough Castle is now the best preserved of all the Antonine Wall forts. 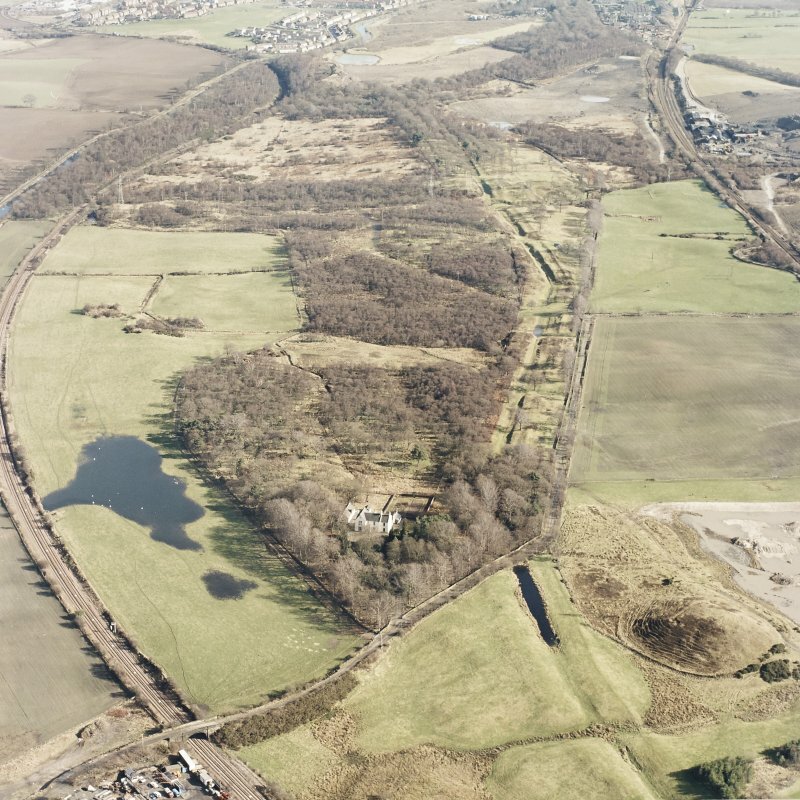 It is the property of the National Trust for Scotland and under guardianship of the DoE who are currently engaged in clearing operations and excavation work on the site. 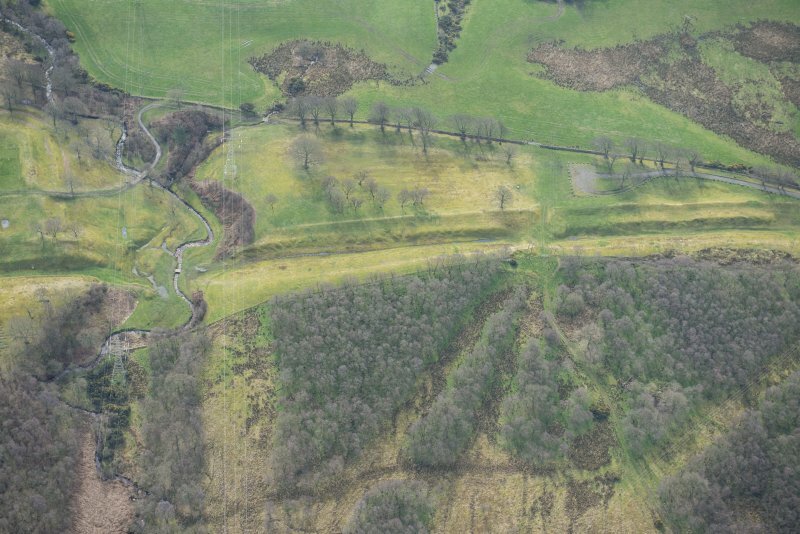 The Antonine Wall and Ditch are very well preserved along the N front of the fort, and the fort rampart and ditches and the annexe ditches are very clearly visible on the E, S and W sides. 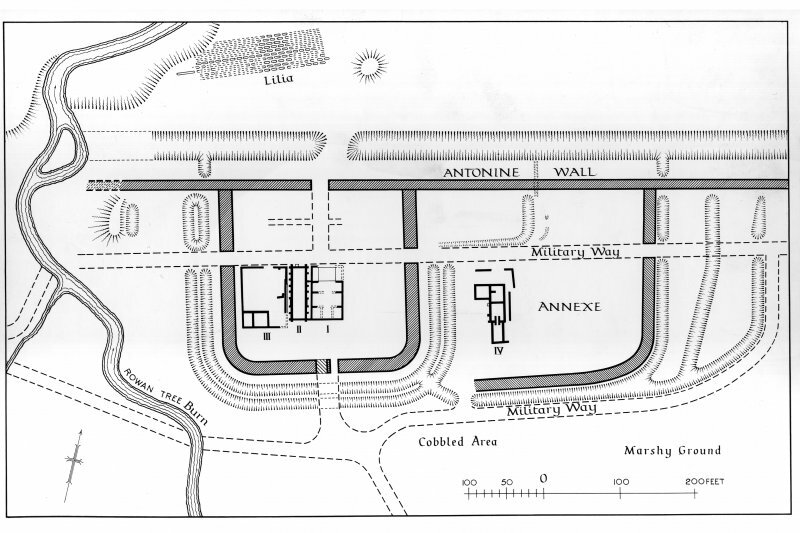 (See RCAHMS 1963 plan fig.38). 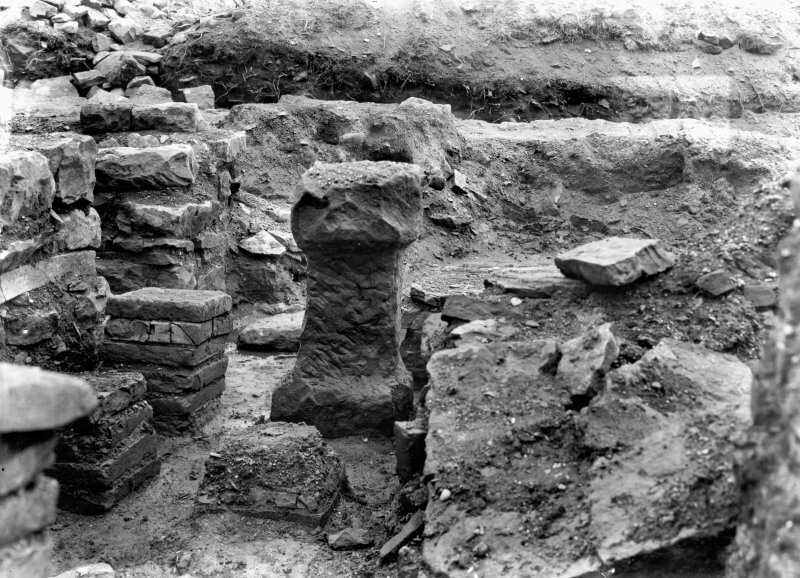 Excavations in 1902-3 and 1932-3 identified the headquarters building, a granary and another stone building, possibly the officers' quarters, within the fort, and the bath-house in the annexe. 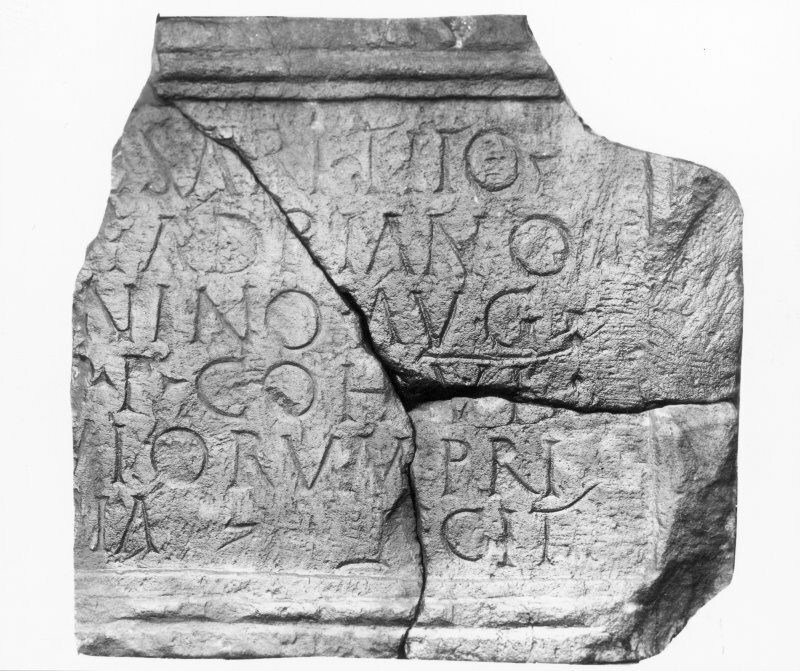 In a hole (possibly the well) in the headquarters building were found three fragments of an inscribed tablet recording the erection of the building by the Sixth Cohort of Nervii, who also set up an altar to the goddess Victory which was found 200 - 300 yds S of the fort in 1843. These stones are in the N M A S. The small finds from here include some potsherds which seem to be of late 1st c date, suggesting that one of Agricola's small forts may have stood here. 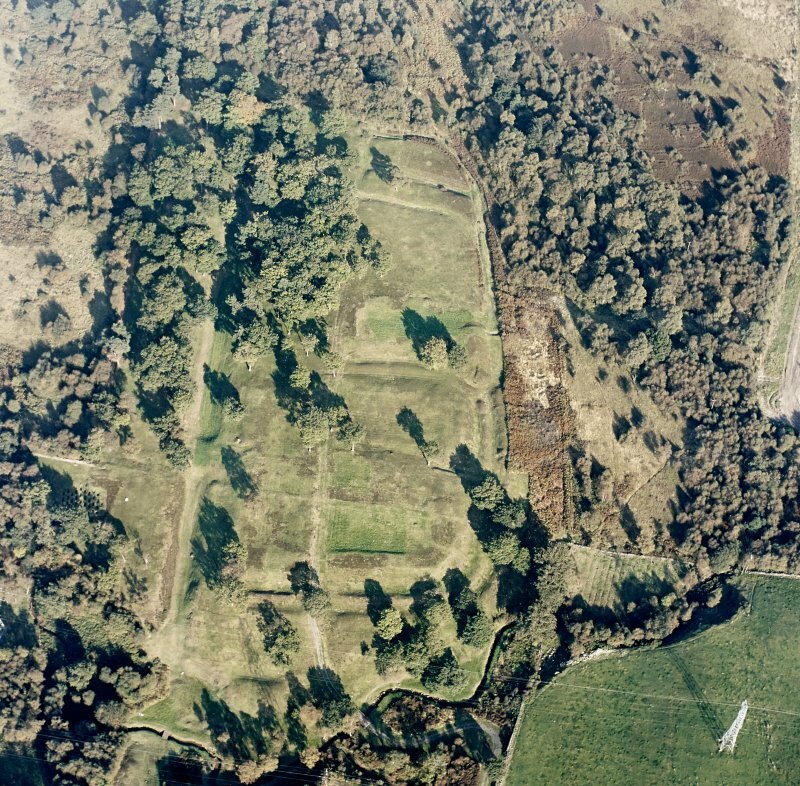 No remains of such a fort have yet been detected, but it has been suggested that its N front may have been protected by the series of ten rows of defensive pits (lilia) NW of the Antonine fort, which itself has been altered and modified at least once during its period of occupation. R Stuart 1852; M Buchanan, D Christison and J Anderson 1905; G Macdonald 1933; G Macdonald 1934; RCAHMS 1963, visited 1958; A S Robertson 1973. 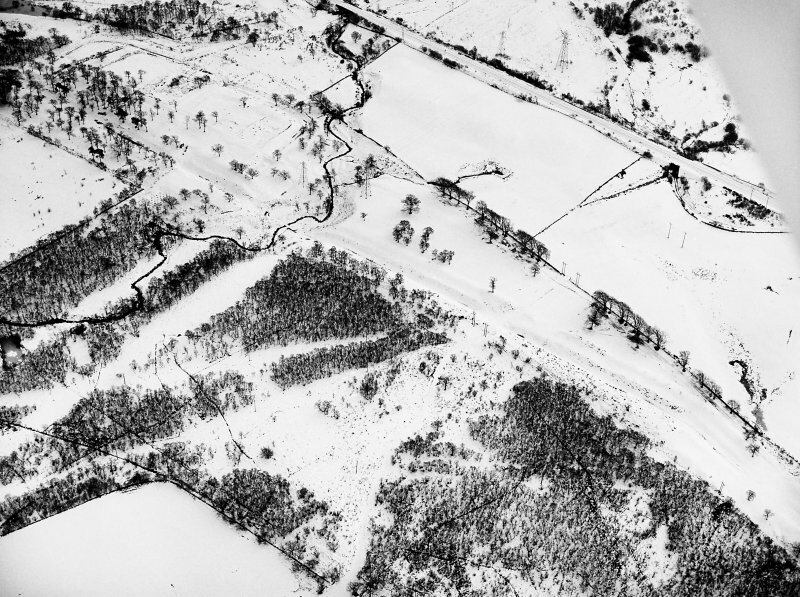 Visited by OS (JLD) 28 January 1957. 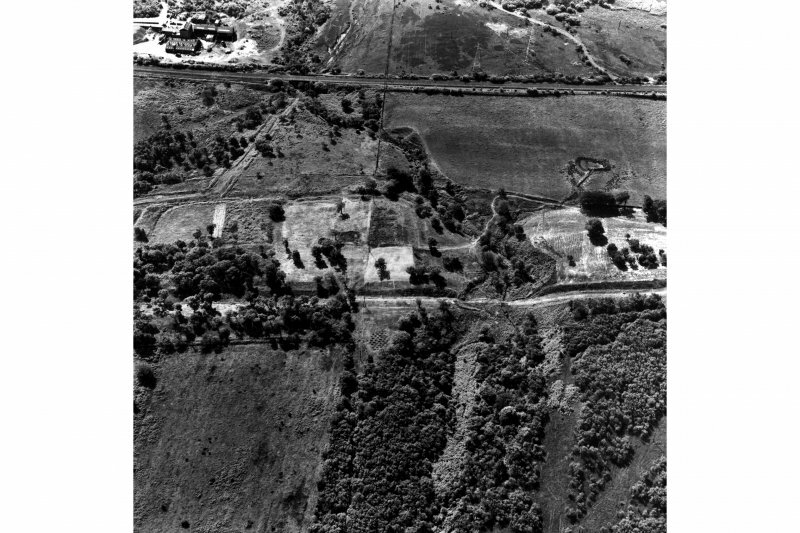 Excavations between 1957-61 with a view to long term conservation of the fort, produced neither pottery nor structural evidence of Flavian occupation. 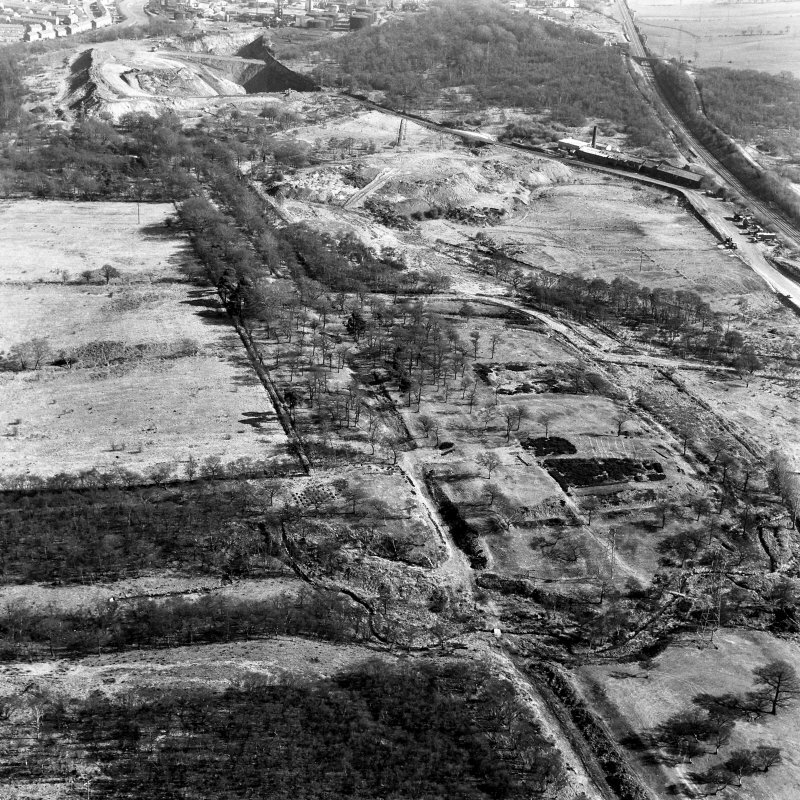 Parts of the Headquarters building, NE and NW quarters, and the defences were investigated. S Cruden 1957; S Cruden 1959; I A Richmond 1959; S Cruden 1961. An Alexandrian coin, probably of Maximian (286-305; 307-8) found in a drainage scheme in the neighbourhood of Rough Castle by an Irish labourer about May 1954 was submitted by T Morgan, 1 Neilson Street, Falkirk in 1955. 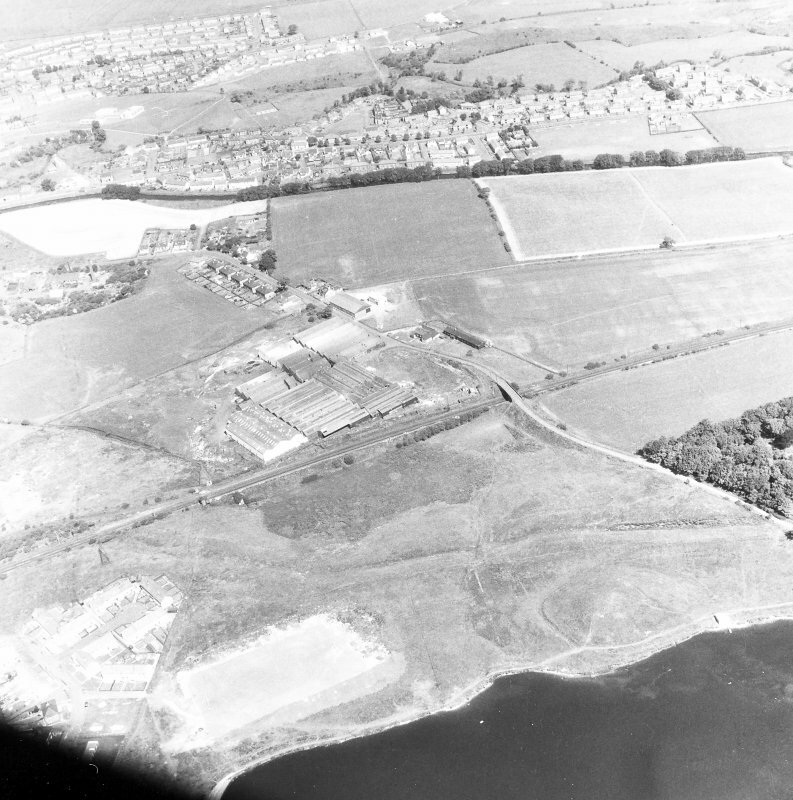 Visible on RAF air photographs: F42 58/3544 0353; RCAHMS; J K St Joseph. (Undated) information in OS archaeology records. No change to previous reports. None of the excavated internal buildings is visible, although an area in the SW of the fort is still open, though overgrown. 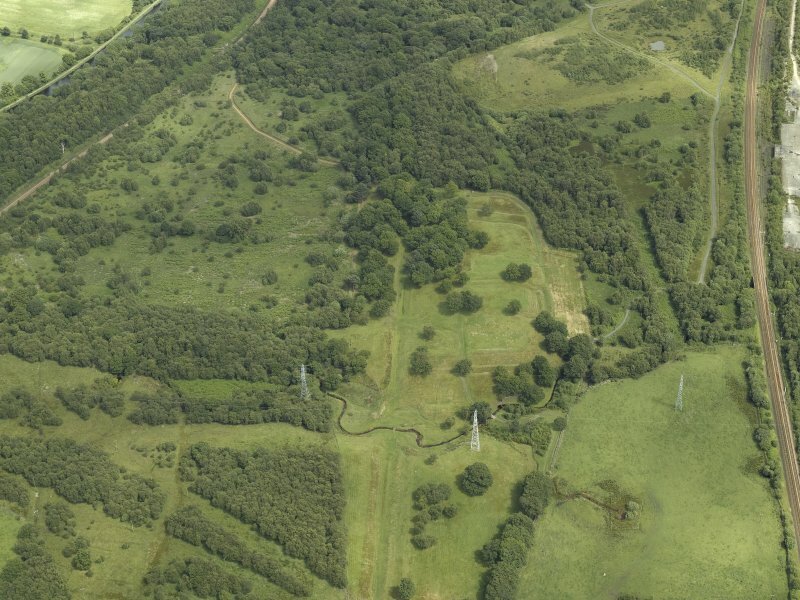 The Military Way is clearly visible approaching the fort from W and E but no surface trace of the loop road around the fort was found. Visited by OS (JRL) 19 June 1980. 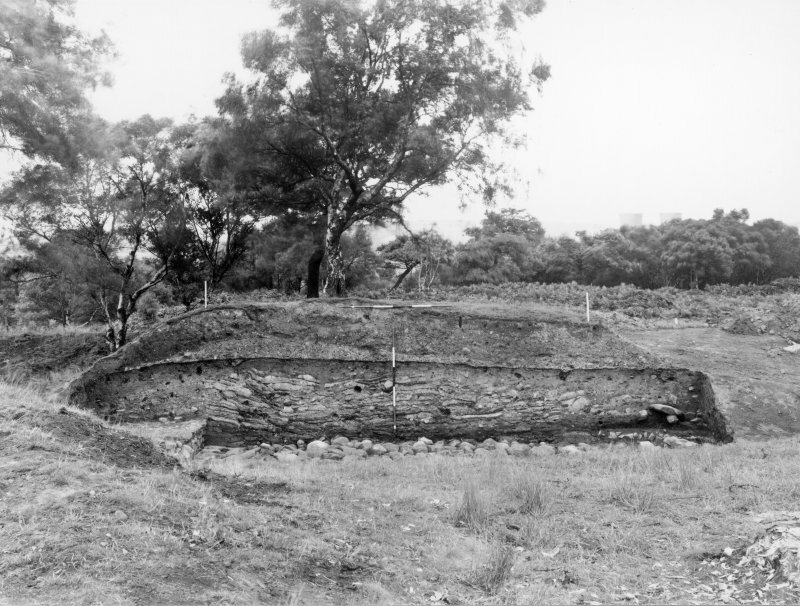 Full report of 1957-61 excavations (see S Cruden 1957; 1959; 1961) given. I MacIvor, M C Thomas and D J Breeze 1981. NS 8423 7986. 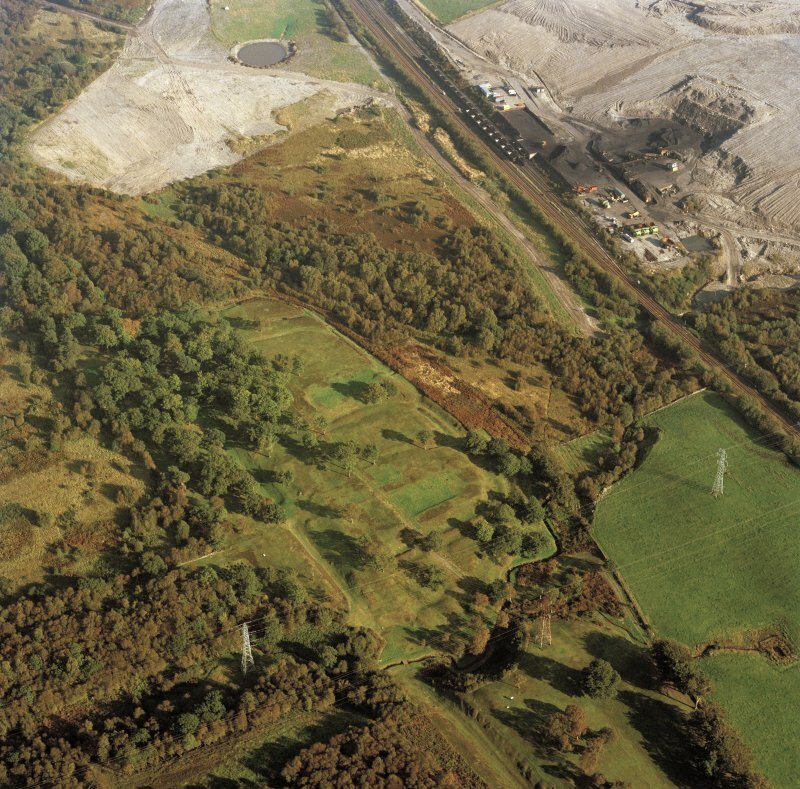 Archaeological monitoring was undertaken on 21-22 May 1995 during the dismantling and removal of the electricity tower which had stood on the E bank of the Rowantree Burn, immediately W of this Roman fort. After removing the conductor and projecting crossarms, the tower was felled eastwards onto a protective covering, causing only minor and isolated superficial damage to the ground beneath the tower. 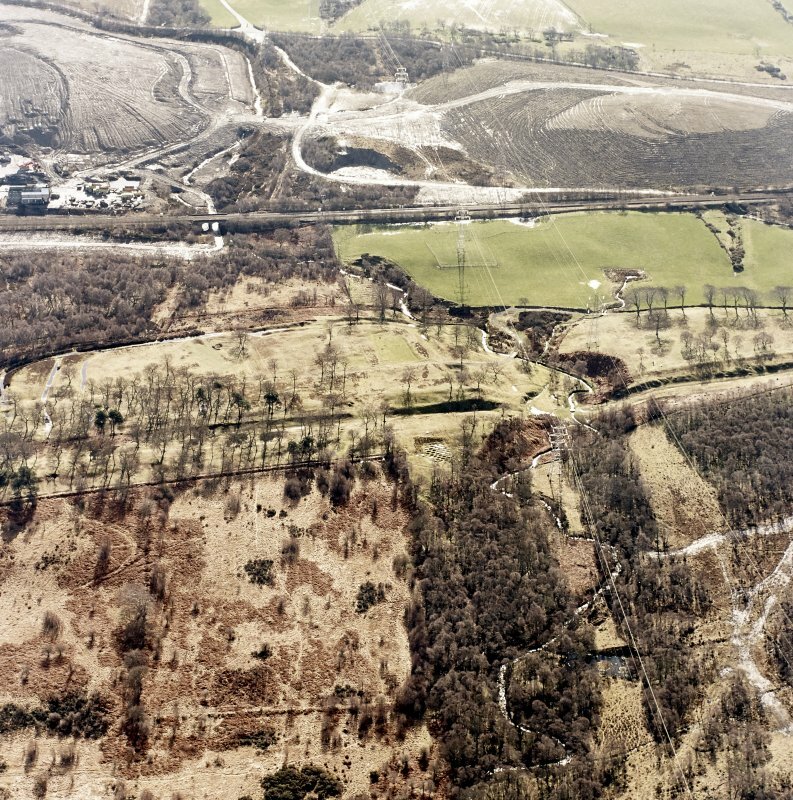 The subsequent cutting of the tower foundations at a depth of 0.5m below ground level was monitored. Four small holes excavated around each tower leg foundation revealed only made up ground associated with the original erection of the tower. No archaeological deposits and features were identified. 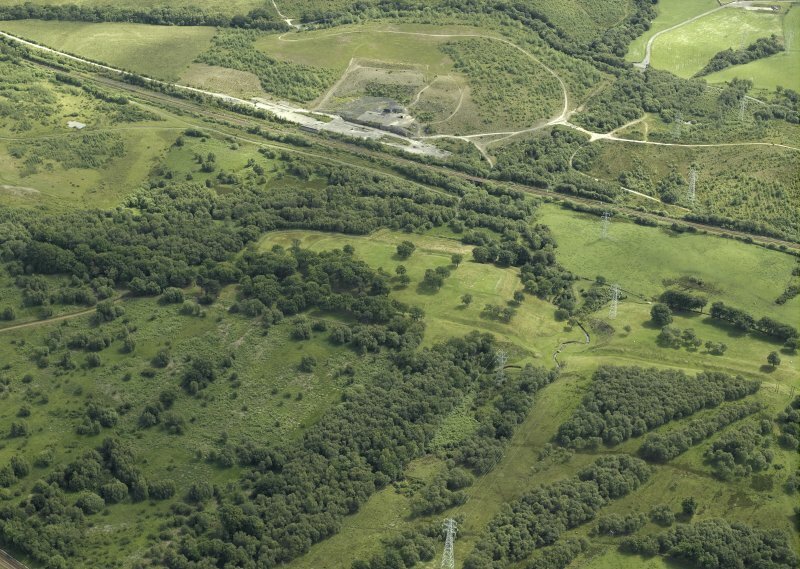 Adherence to a Methods Statement for the removal of the tower, agreed in advance between Historic Scotland and Scottish Power, ensured that no damage occured to the site. 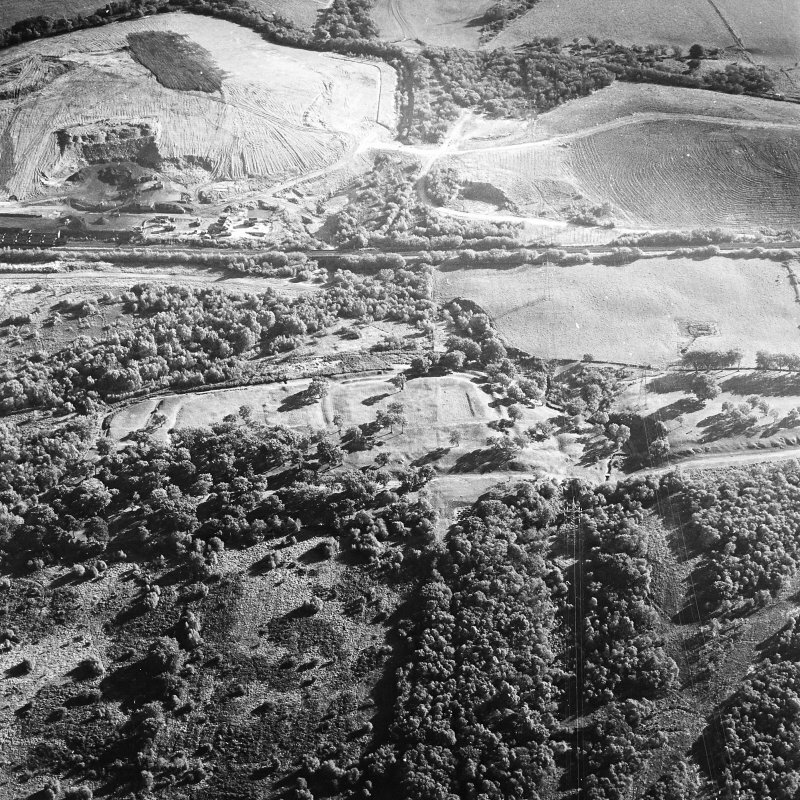 The removal of the electricity tower had markedly improved the visual setting of Rough Castle fort. Full details are in a report lodged with the NMRS. A Dunwell and B Finlayson 1995; NMRS MS/726/73. NS 843 798 A heavily-corroded Roman iron axehead was found at Rough Castle, apparently where it had been discarded in the course of illegal metal-detecting. 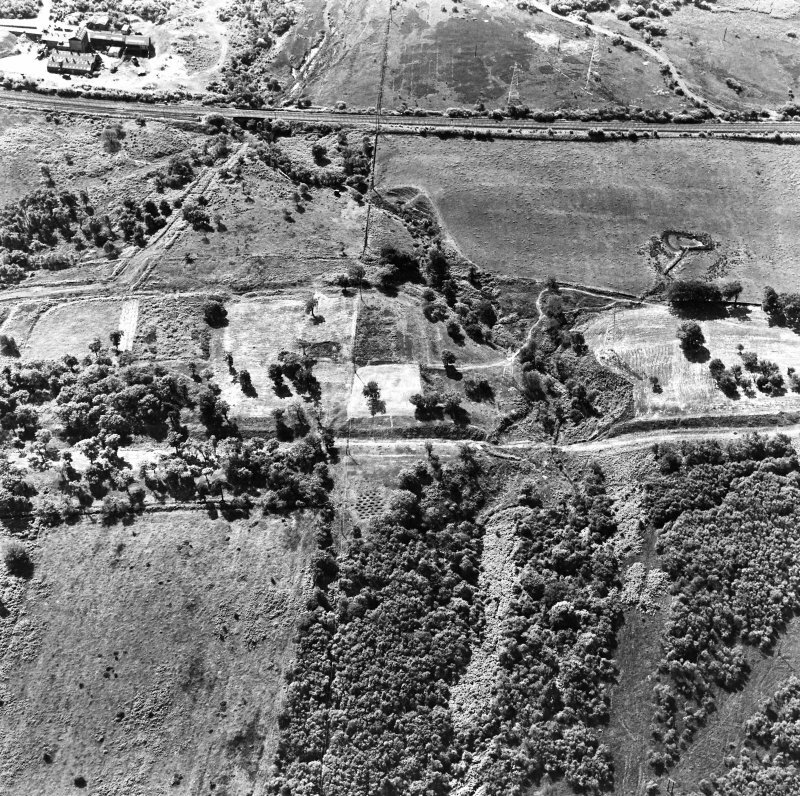 The find-spot lies within the fort, between the Principia and the E rampart. The find was reported to the National Museum of Scotland and subsequently donated to Falkirk Museum. NS 8465 7985 A watching brief was conducted in the vicinity of Rough Castle Roman fort, during the erection of an electricity pylon. Four small trenches were excavated (2.0m by 0.50m) to facilitate the erection of the pylon. In addition, a watching brief was carried out when a c100m length of cable trench was excavated. 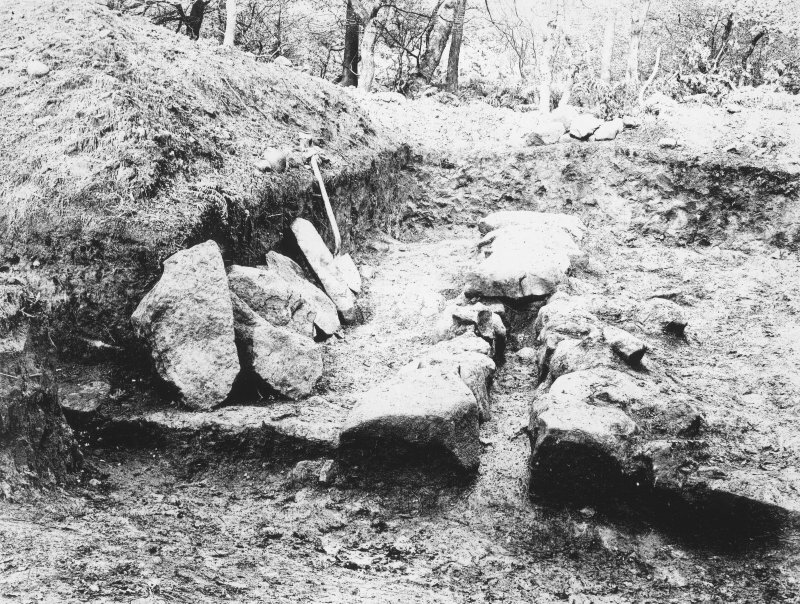 This cable trench was close to the alignment of the Military Way, forming part of the Roman frontier works. 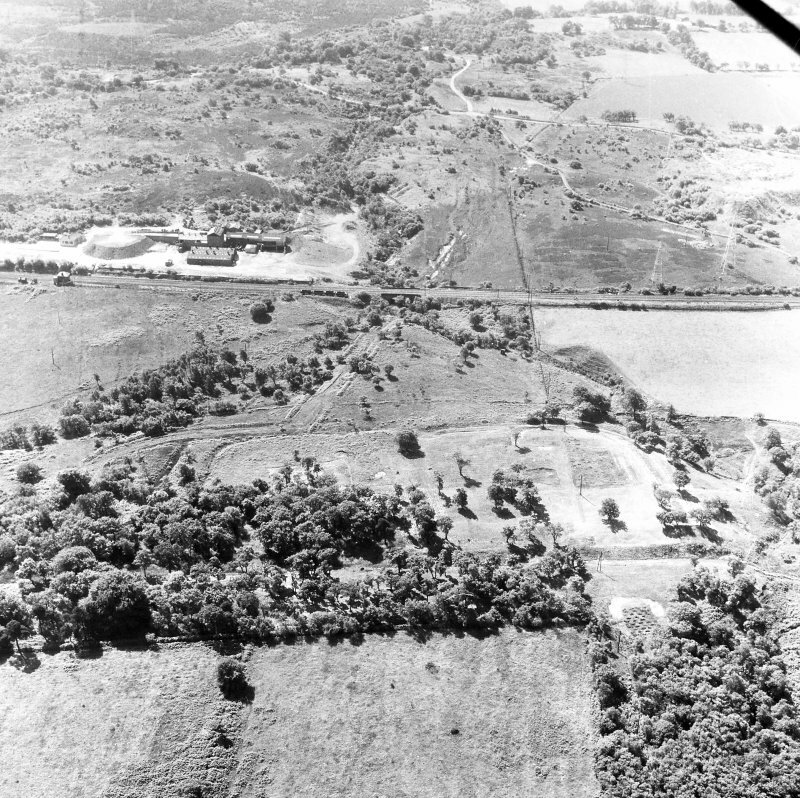 During both monitoring operations, no archaeological features or deposits were located. An axehead found by metal-detecting within the fort, E of the principia, is now in Falkirk Museum. L J F Keppie 1996. (MacIvor, Thomas and Breeze 1980, 271, no. 296). 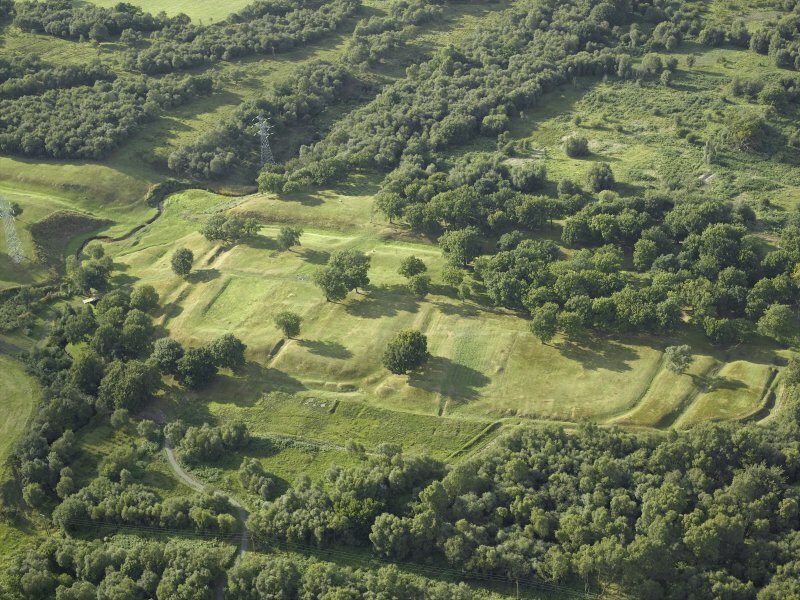 The well-preserved Roman fort of Rough Castle has formed a major element of the Antonine Wall defensive system. It probably housed the greater part of the cohors VI Nerviorum for two periods within the years 142 and 164 AD approximately, and is situated on a prominent N-facing escarpment in an area where industrial activity has greatly modified the landscape. 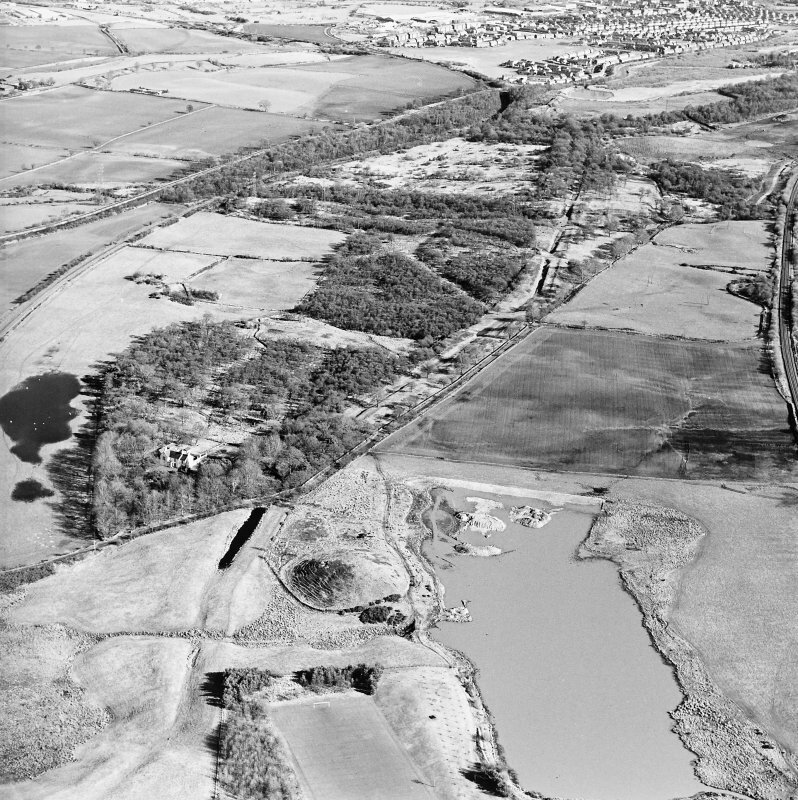 The nearest navigable water was probably in the vicinity of the River Carron which, at its nearest point, is 1.5km to the N of the fort and at an altitude about 50m lower. 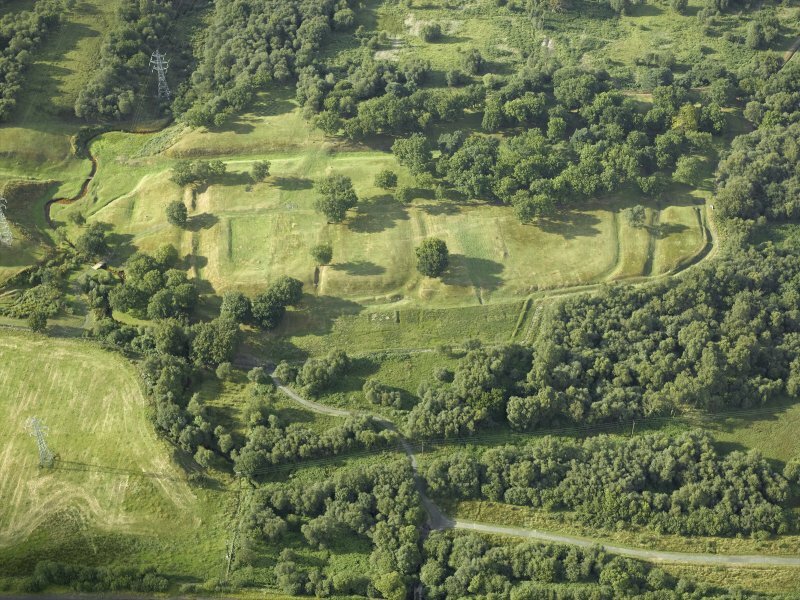 The later campaigns of excavation on the fort have recently been published. The existence of waterlogged deposits or conditions suitable for the preservation of organic remains is not discussed in detail and the provenance of many of the objects is not specified, although the majority are said to be unstratified. Among the finds there is a 'paddle-like object' of oak which has apparently suffered from splitting. As it survives, it measures 0.34m in length over all, of which the blade (of elongated oval form) accounts for 0.23m, and the rectangular-sectioned stock or handle forms the remainder. The blade is incomplete, but appears to have been roughly oval; the asymmetrical shoulders taper into the shaft which measures 70mm by 20mm in cross-section and is set at right-angles to the blade; it terminates in a neat cut which indicates that the object is preserved intact. Although the form of this object strongly suggests an identification as a paddle, its small size casts doubt upon its possible use for propulsion; it may have been a mill-paddle. I MacIvor, M C Thomas and D J Breeze 1980; W S Hanson and G S Maxwell 1983; R J C Mowat 1996. 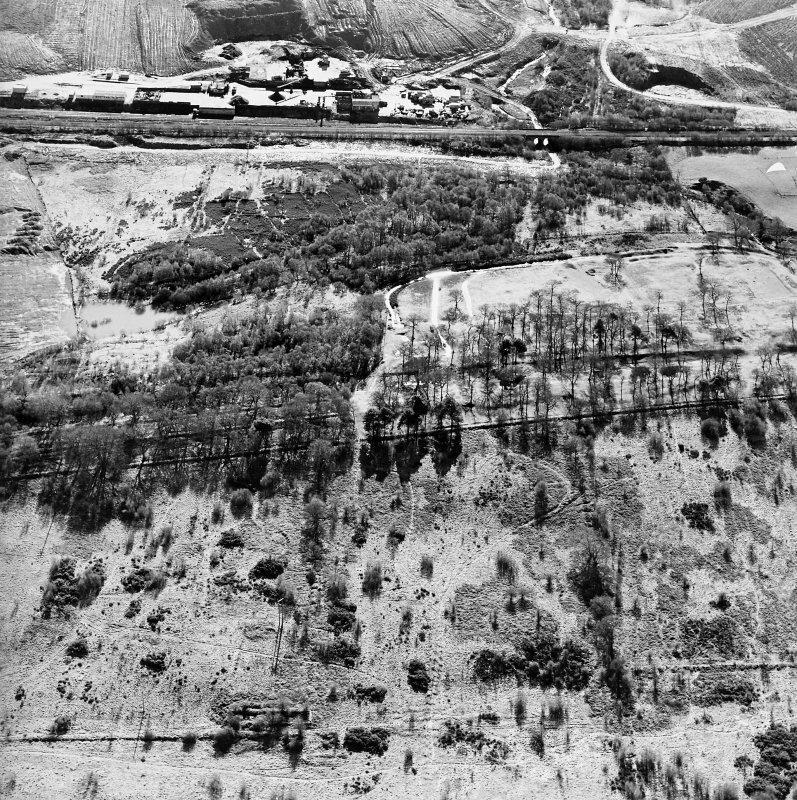 NS 851 797 An underground electricity cable trench was excavated in the vicinity of Rough Castle Roman fort. 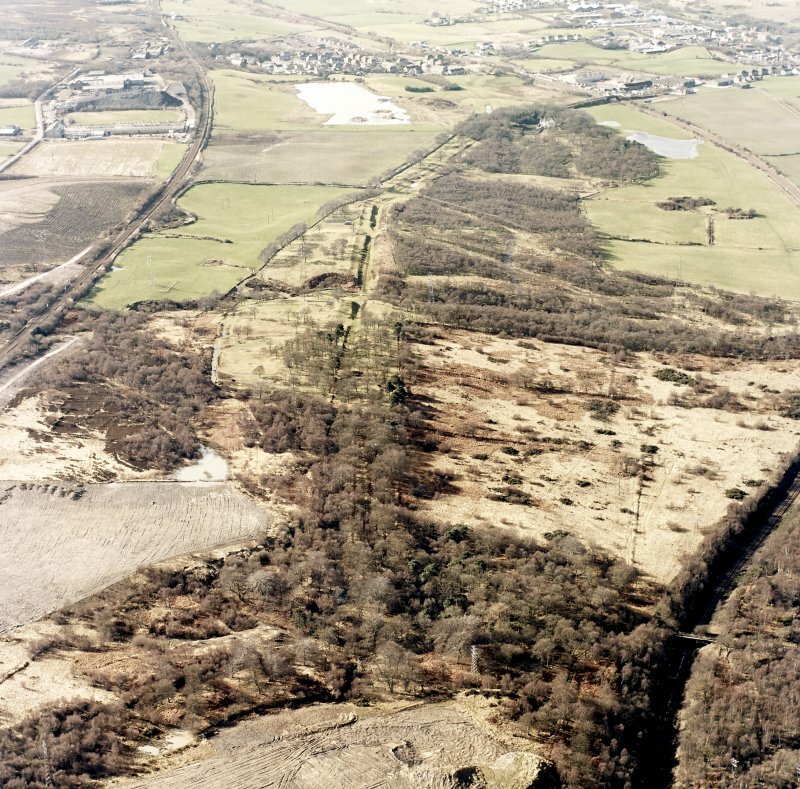 The cable route ran for 55m and lay to the S and W of the Antonine Wall and associated frontier works, close to the position of the military way. 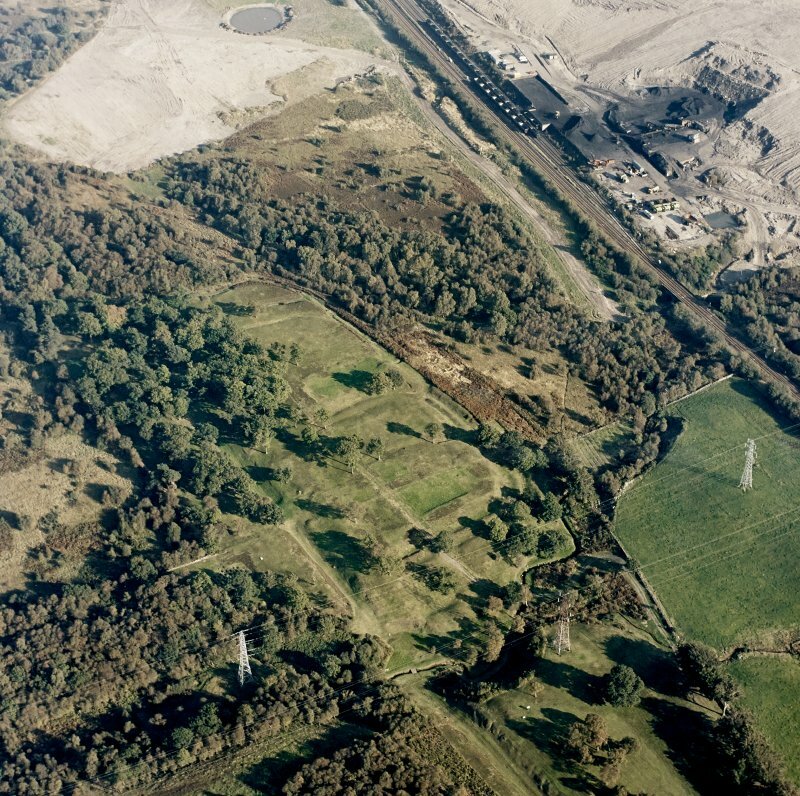 The watching brief in March 2001 demonstrated that no archaeologically significant remains were disturbed during the excavation of the cable trench. 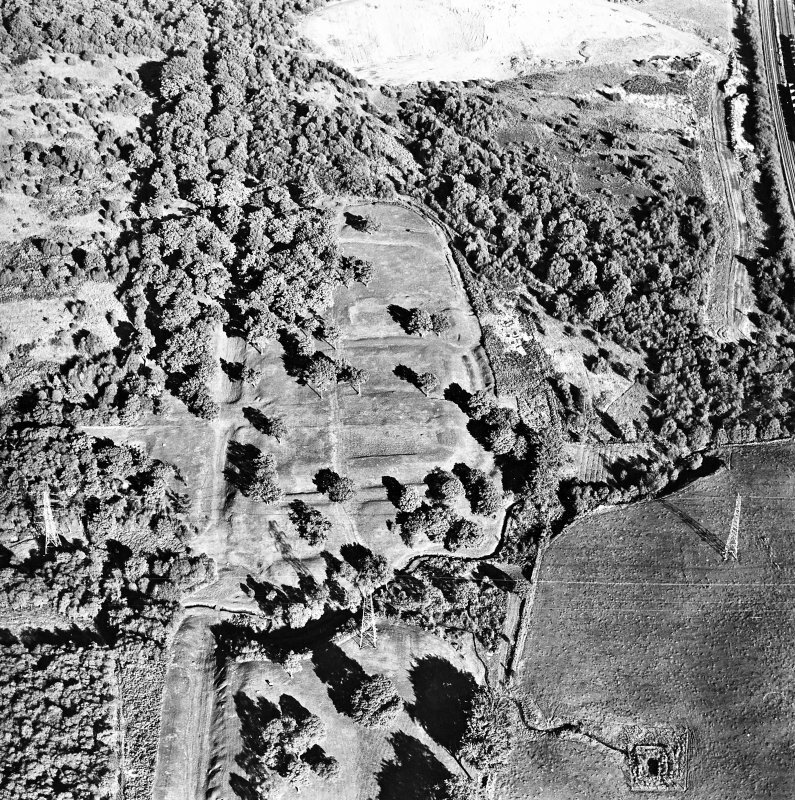 NS 8423 7984 Archaeological monitoring was undertaken in March 2003 during excavations intended to improve drainage on the Antonine Wall on the W side of the burn, immediately to the W of Rough Castle Roman fort. 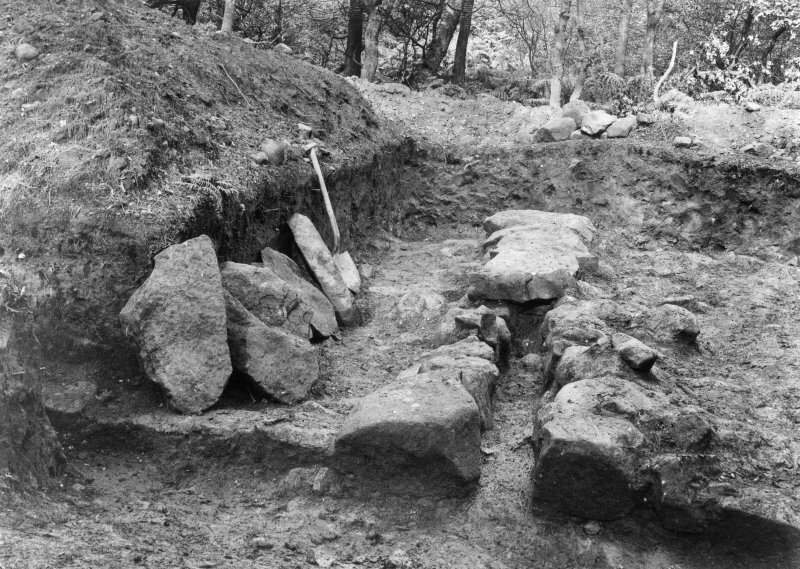 The excavation followed the path of an existing modern pipe, and no features or finds of archaeological significance were uncovered. (Schedule no. 8244). 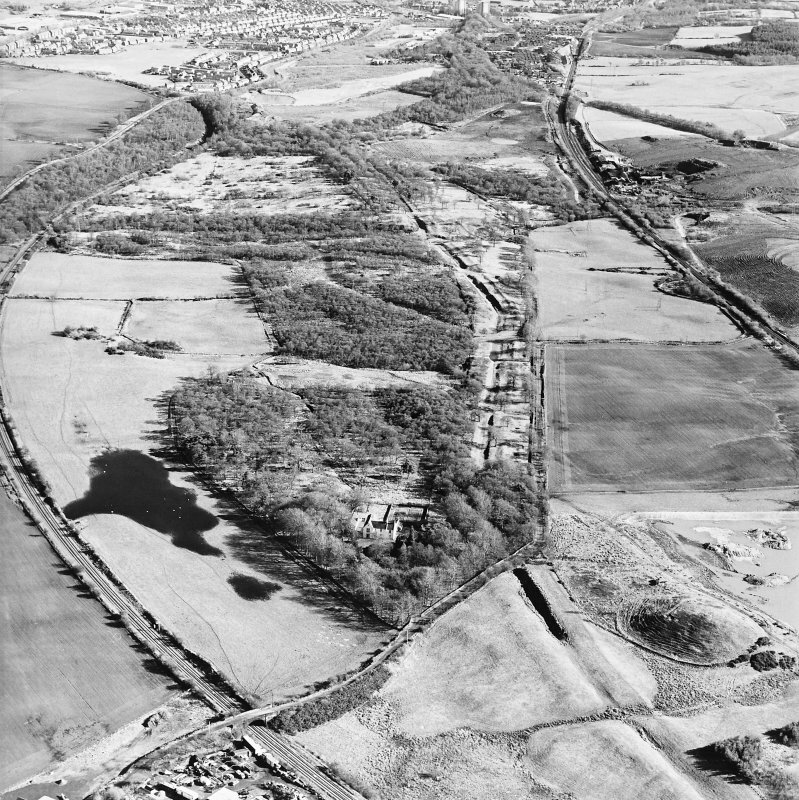 The Antonine Wall from Rough Castle to Lime Road, Tamfourhill, Falkirk is scheduled, together with the Rough Castle Roman fort and multi-period field-system. Information from Historic Scotland, scheduling document dated 4 March 2005. 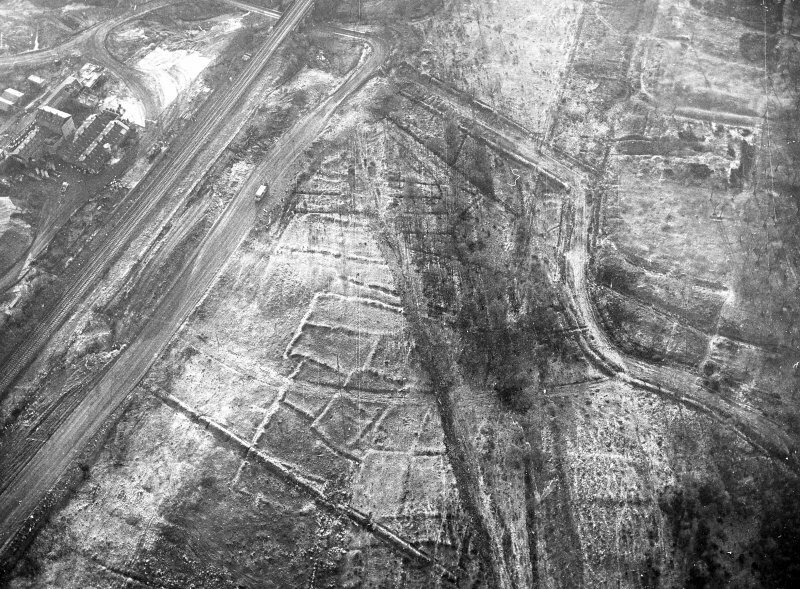 NS 8425 7990 An archaeological watching brief was undertaken in January 2006 at Rough Castle on the Antonine Wall while Historic Scotland personnel undertook minor excavations to investigate the location and condition of drainage channels installed during the 1950s and 1960s. 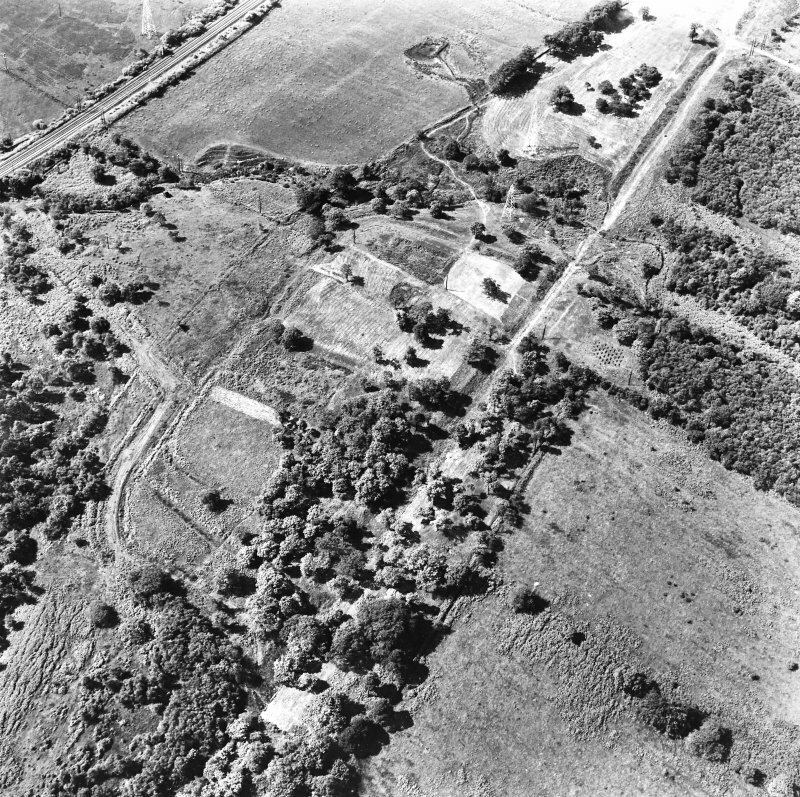 The area of the fort subject to this exploratory work was near the NW corner of the fort and the defensive ditch of the wall. 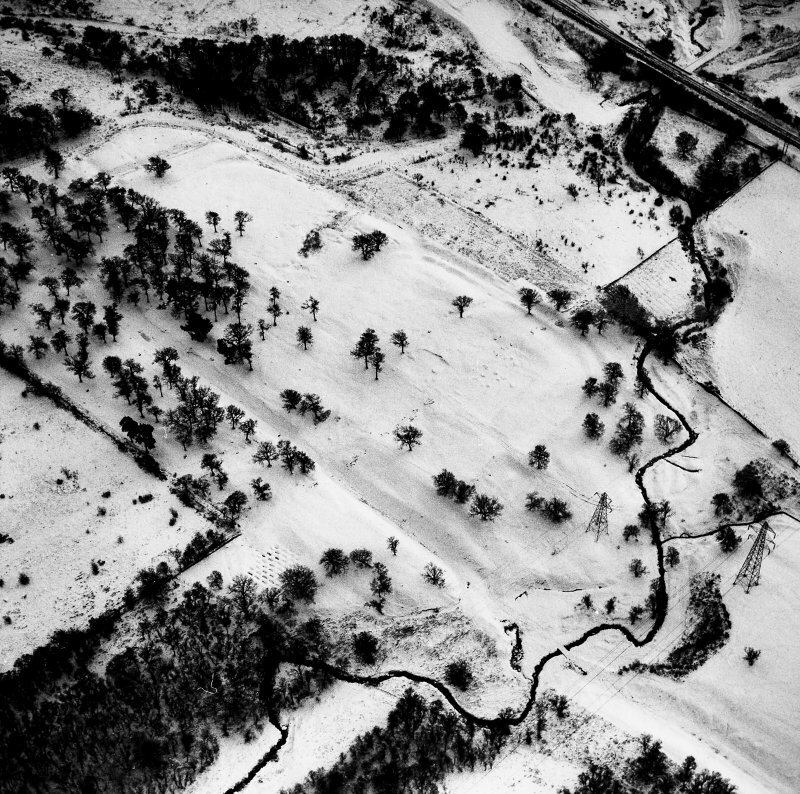 No features or finds of archaeological significance were encountered during these works. NS 843 798 Archaeological monitoring was carried out in April 2006 for Central Scotland Forest Trust in respect to upgrading and alterations to footpaths in the Rough Castle Woodland. 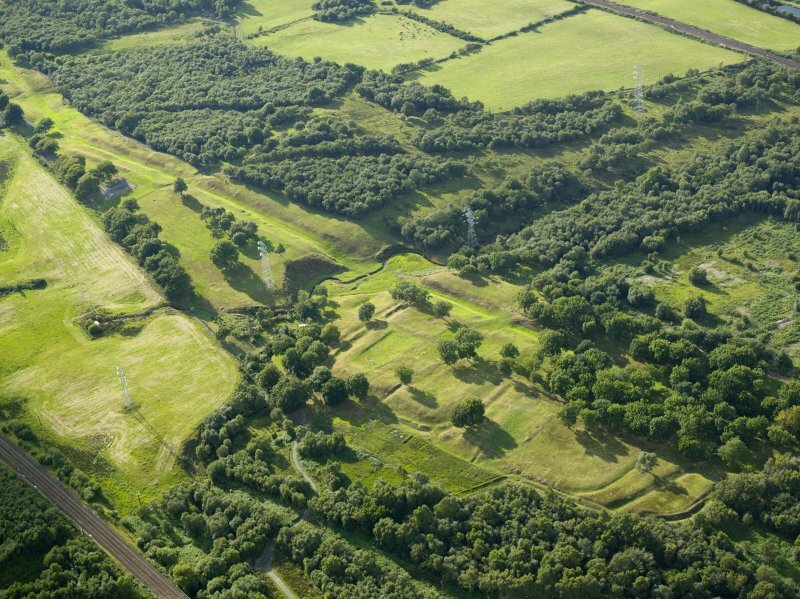 These works lie in and around the Antonine Wall and Rough Castle Roman Fort, both scheduled ancient monuments. 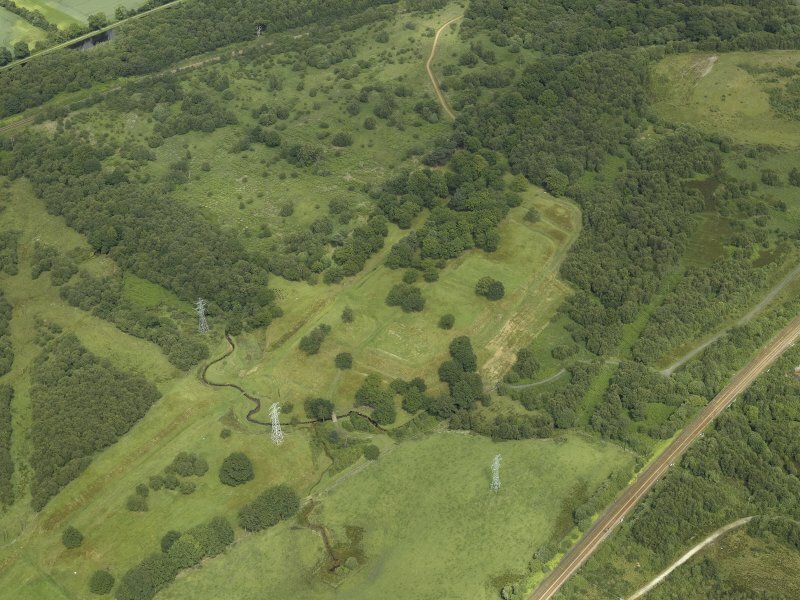 The monitoring was undertaken within the terms of the issued Scheduled Monument Consent. 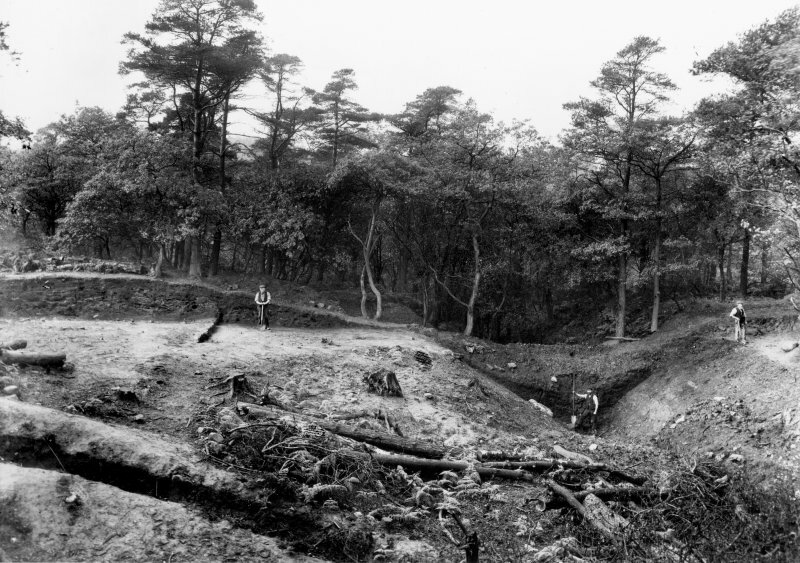 No archaeologically significant material was identified during the topsoil stripping and hand-digging of chicane postholes. 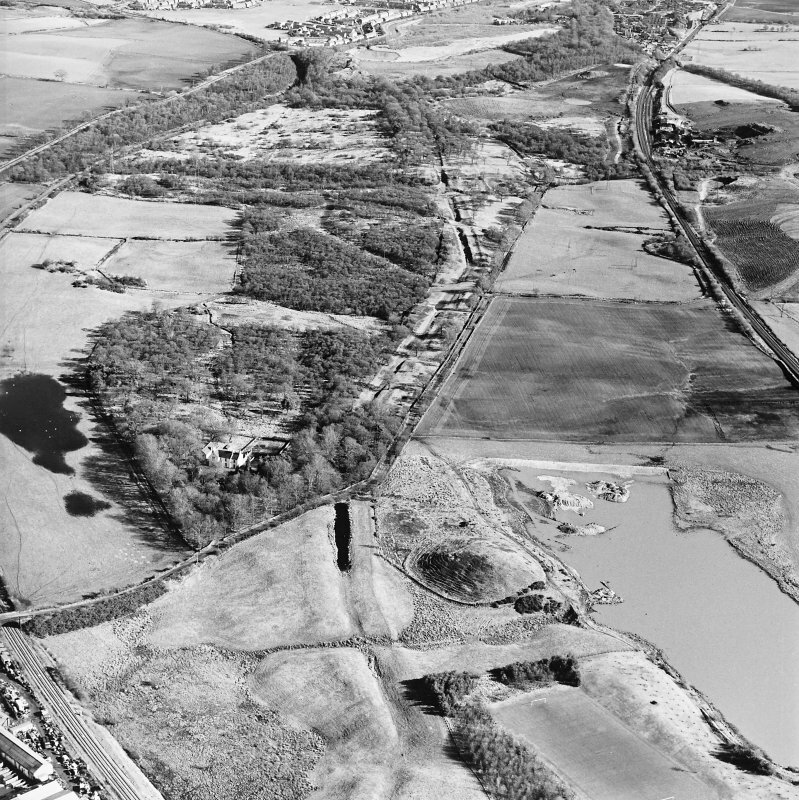 Report to Falkirk Archaeology Service, Historic Scotland. Sponsor: Central Scotland Forest Trust. 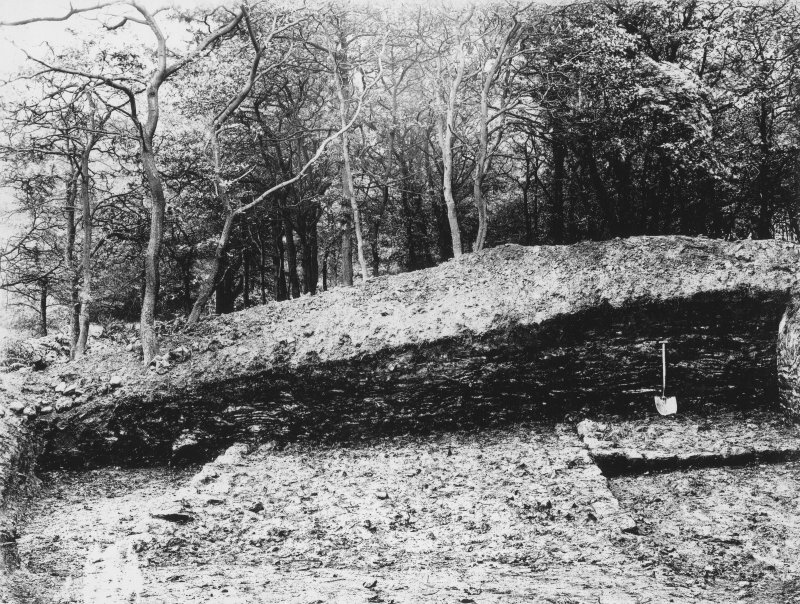 NS 8425 7990 This work comprised the uncovering and recording of a stone-lined pit accidentally uncovered when railway sleepers used to cover it had given way. 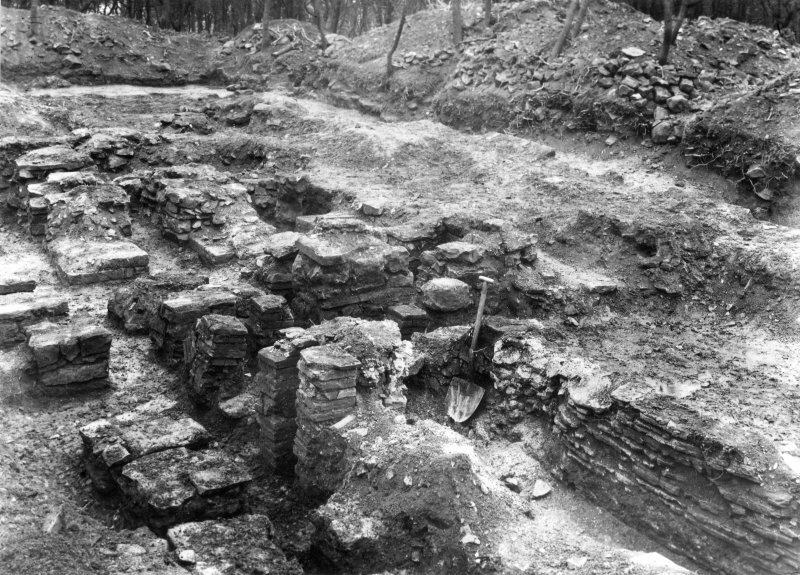 This Roman fort was excavated in 1957-61, and it was the stone-lined pit discovered during that excavation in the via principalis that was to be examined during these new works. 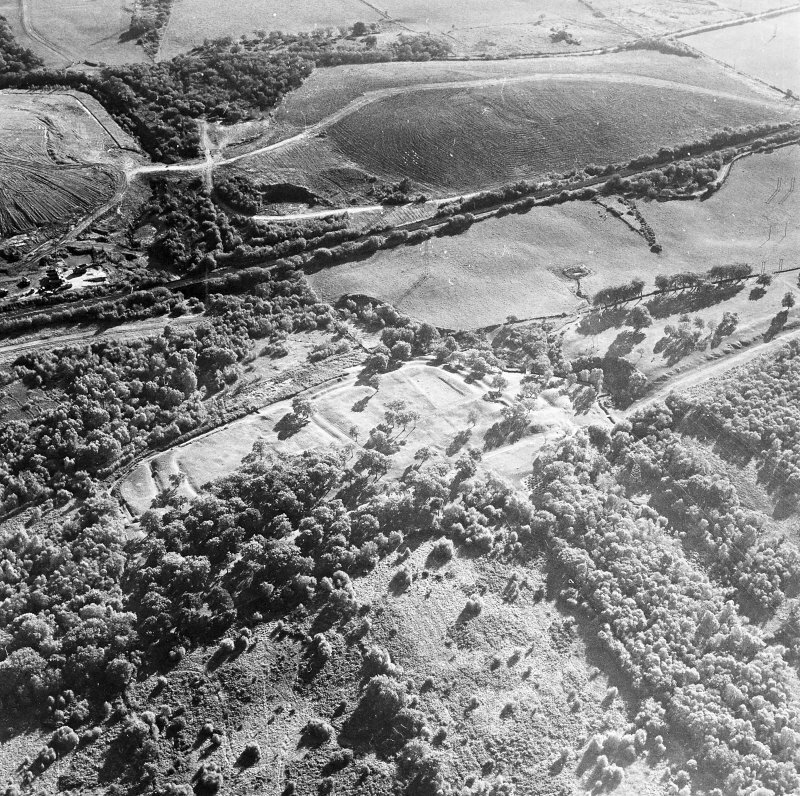 The pit was recorded and photographed in June 2006 and was found to have survived much as described as in the 1981 report. The Sixth Cohort of Nervii set up an altar to the goddess Victory, which was found 200 - 300 yds S of the fort in 1843. NS 8436 7991 For details of Rampart excavations on the N side of Rough Castle fort see NS87NW 6 . 1 of 3 sections at Rough Castle. NS 8436 7991 For details of Rampart excavations on the N side of Rough Castle fort see NS87NW 6 . 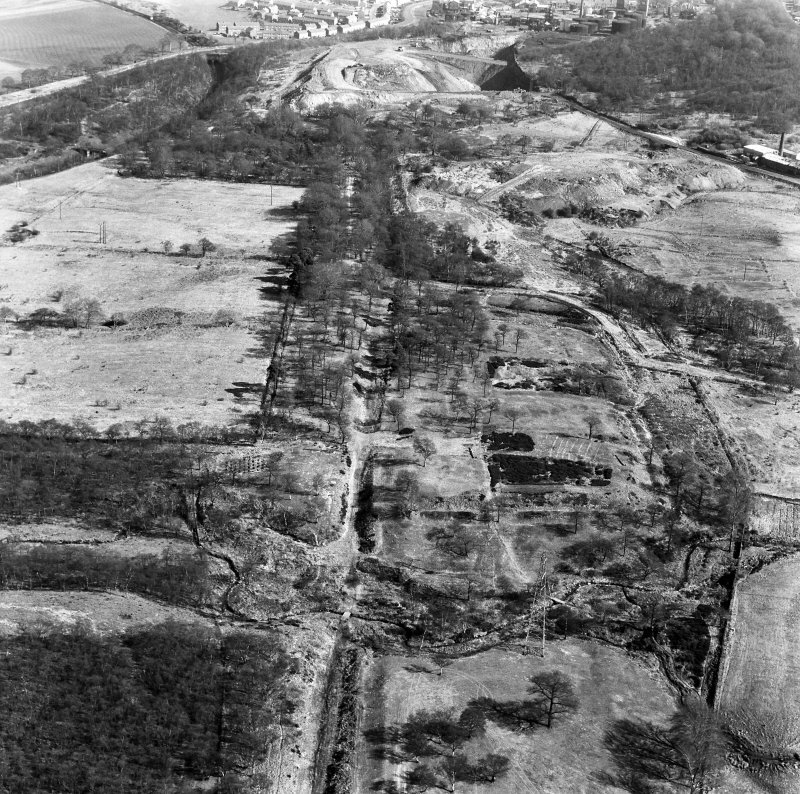 Several cross-sections cut across Antonine Wall (Macdonald, George). NS 8436 7991 For details of Rampart excavations on the N side of Rough Castle fort see NS87NW 6 . 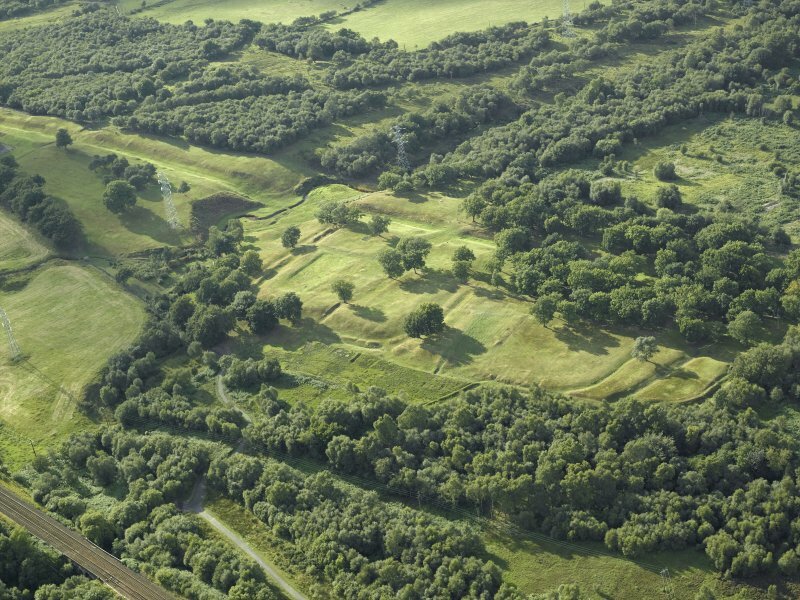 1 of 2 trenches across Antonine Wall; 10 trenches total in Fort (MacIvor, Iain). 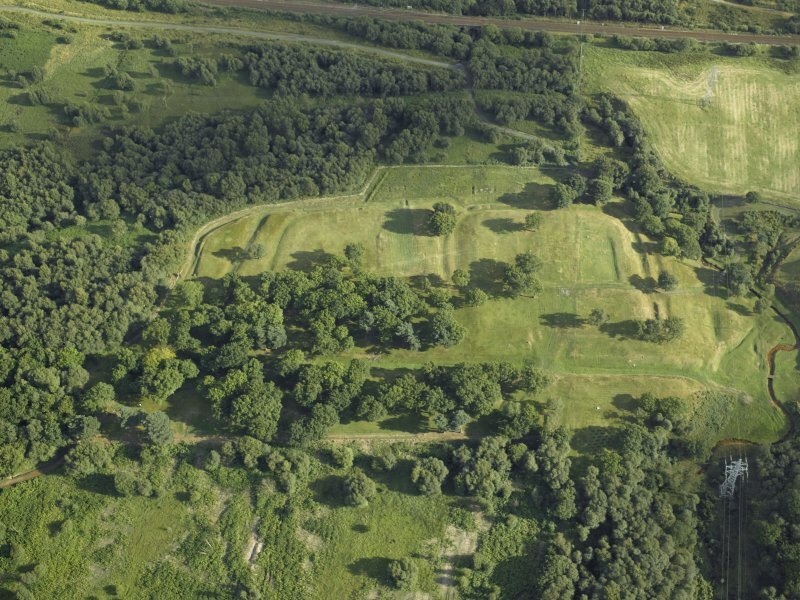 The best-preserved section of the Antonine Wall lies between Bonnybridge House (NS 834799) and the fort at Rough Castle. 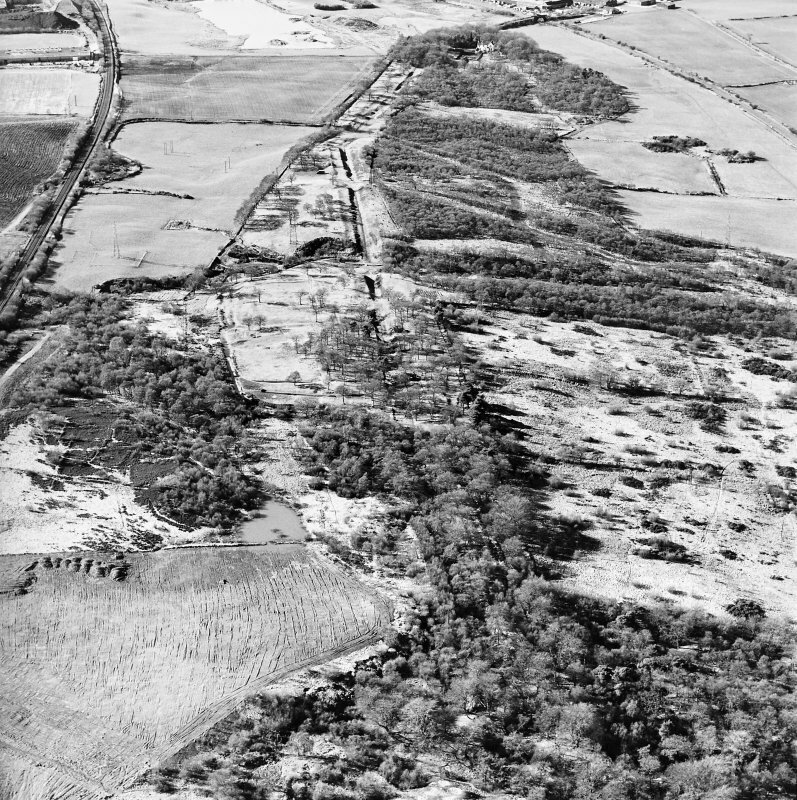 This section includes fine stretches of the rampalt and ditch, with the remains of two signalling platforms, traces of the Militaty Way and the most complete of the Wall forts. 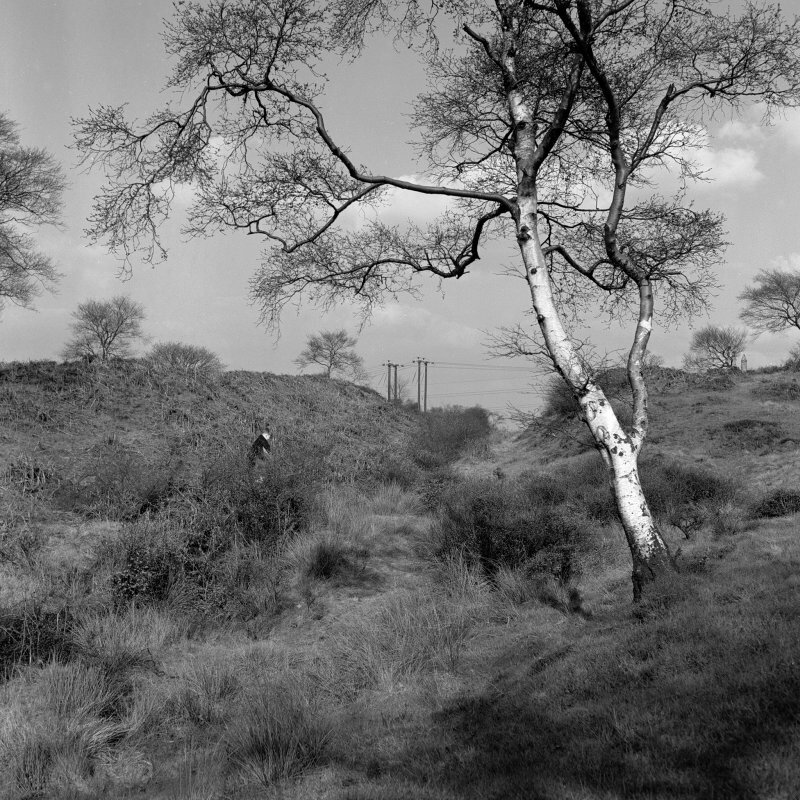 The fort and its annexe lie at the east end of this section of the Wall and occupy a carefully chosen position in the angle between the rampart and the gully of the Rowantree Bum. 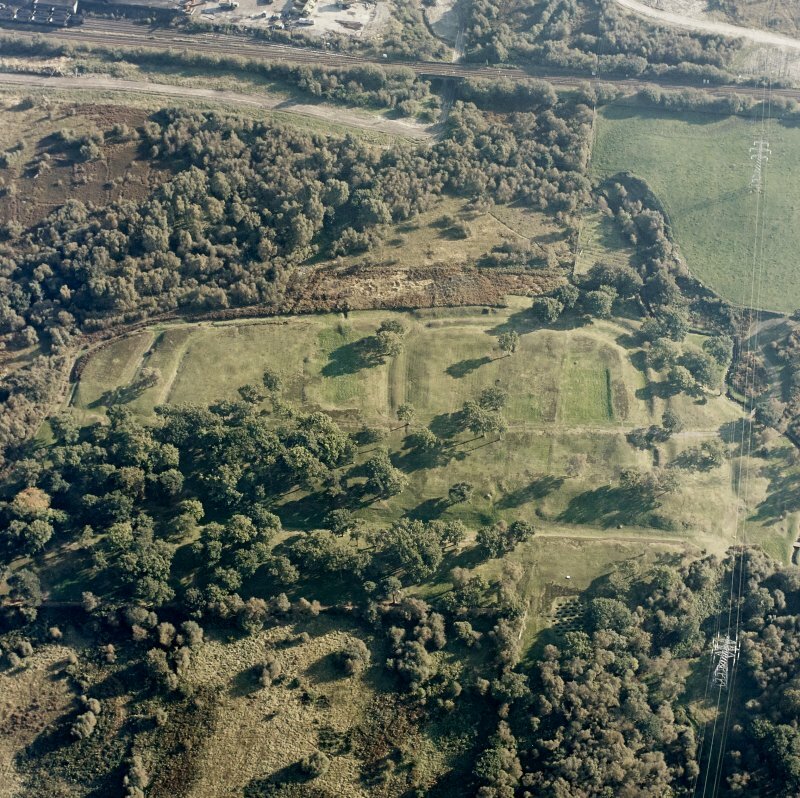 Rough Castle is one of the smallest of the forts along the Wall (0.4 ha) and it was excavated in 1904 (the remains of the stone buildings found at the time have been reburied). 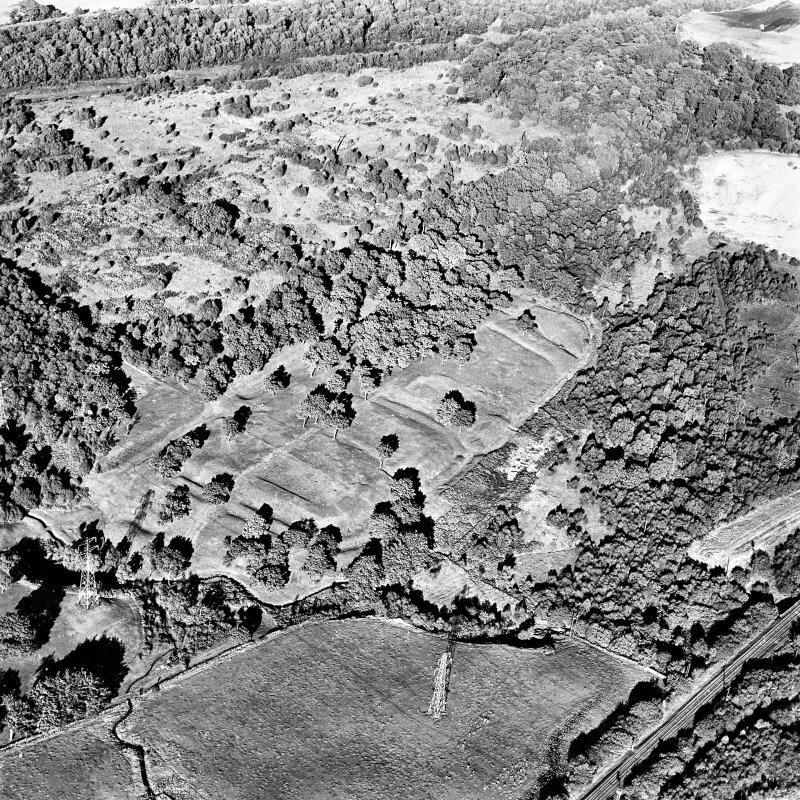 The fort was defended by a turf rampart that was butted on to the Wall sometime after the latter's construction, but they were both part of the same plan, as a causeway had been left by the ditch diggers to allow access to the fort from the north. 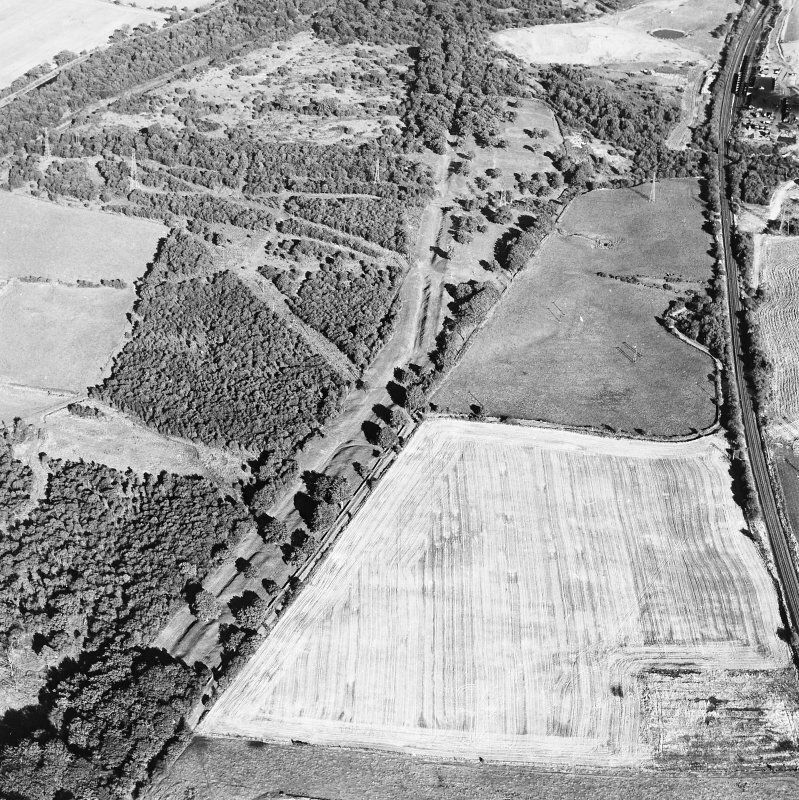 The Military Way entered the fort through the West Gate, after crossing the Rowantree Burn on a wooden bridge, whence it became the plincipal road in the fort before leaving again by the East Gate; a by-pass for through-traffic along the Military Way ran around the south side of the defences. 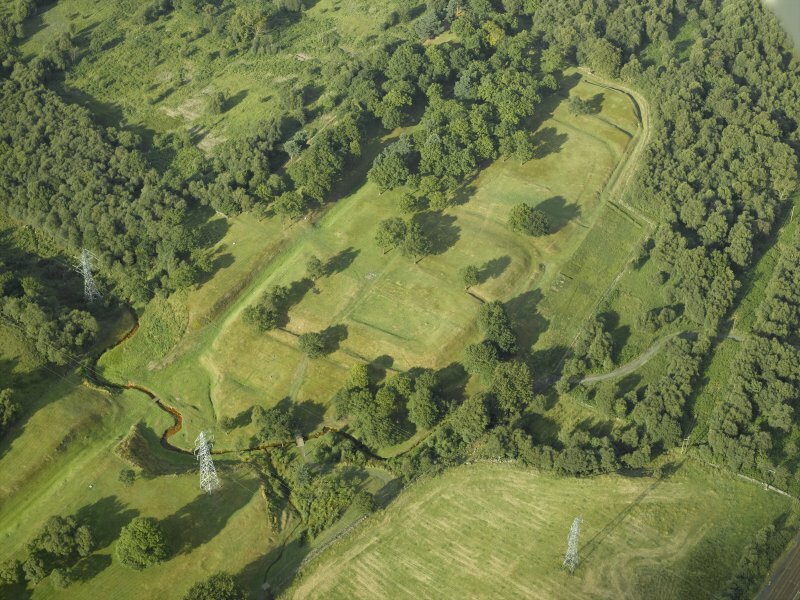 An annexe was built on to the more open east flank of the fort; it was defended by a rampart and single ditch on the south, but on the east there were two additional, rather widely spaced, ditches. 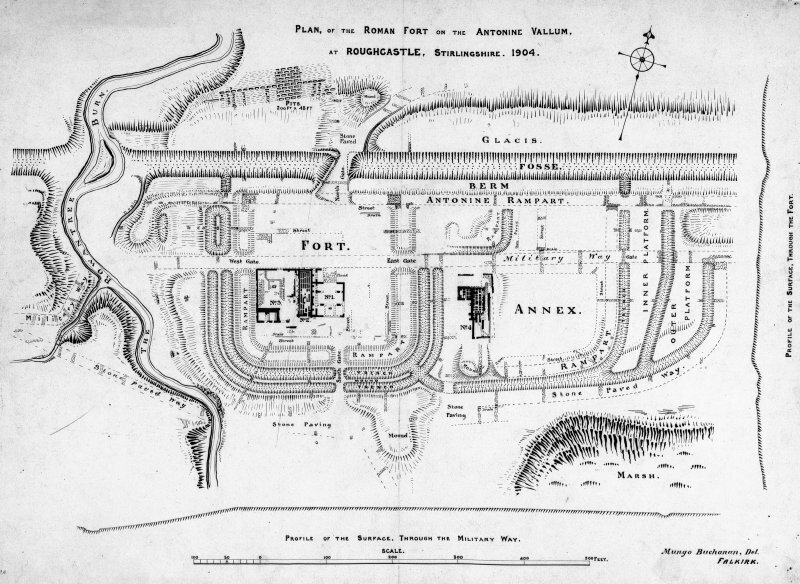 The annexes to Wall forts provided extra space but also served as ideal locations for bath-houses which were considerable fire-risks if placed within the forts themselves. 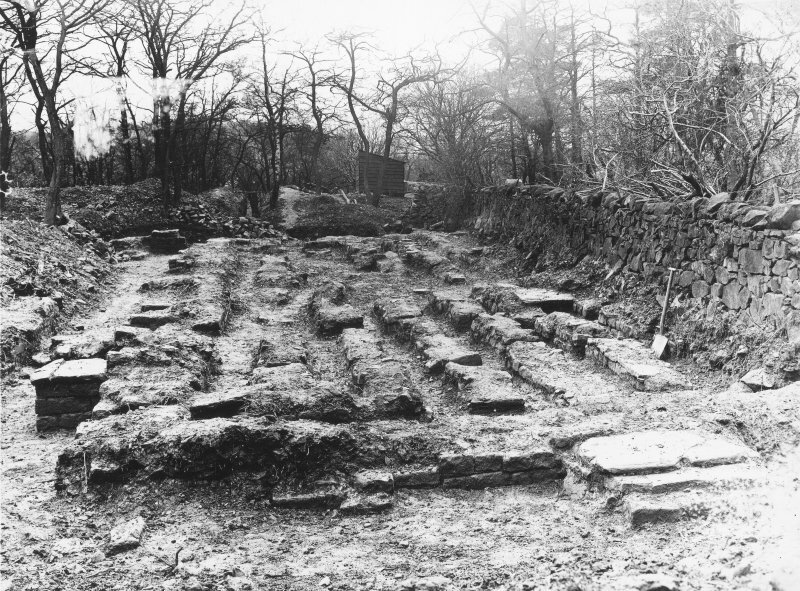 The excavators reburied the bath-houses but the remains of a comparable building, also located in a fort annexe, can be seen at Bearsden fort, no. 75. 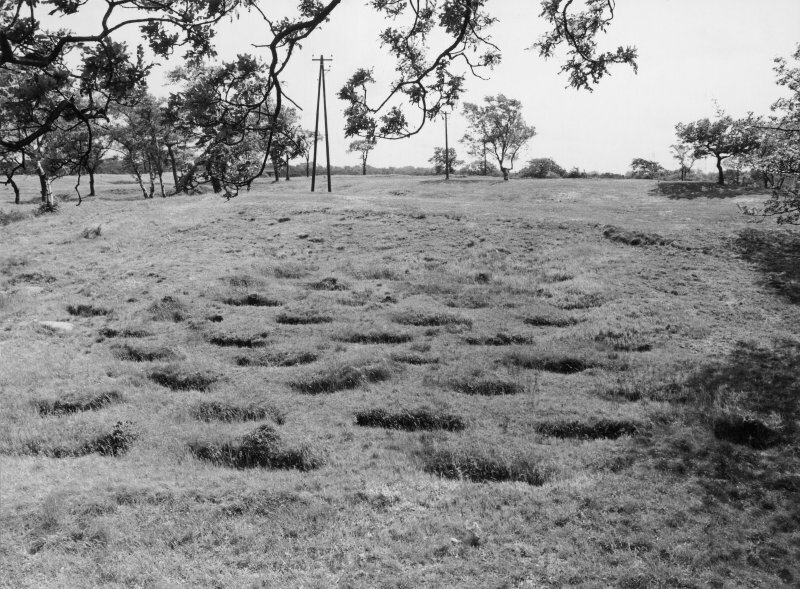 An unusual feature of the defences at Rough Castle, and only discovered because of the excavation, is a regular selies of pits, which concealed sharpened stakes, lying to the north-west of the causeway across the Wall ditch. These pits, known as lillia (lillies), were designed to break up any massed attack on the vulnerable gateway through the Wall. Between the fort and the car park, and west of the car park, the Wall and ditch survive in good condition. 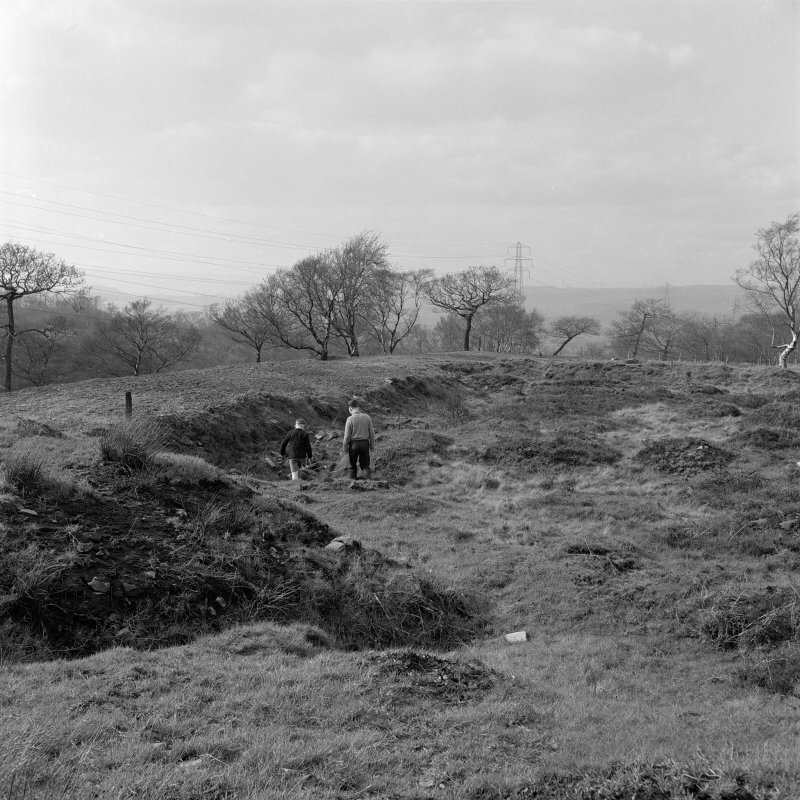 About 60 m west of the cattle-glid at the entrance to the site, there is a beacon- or signalling-stance attached to the rear of the Wall, and another is situated closer to Bonnybridge House. 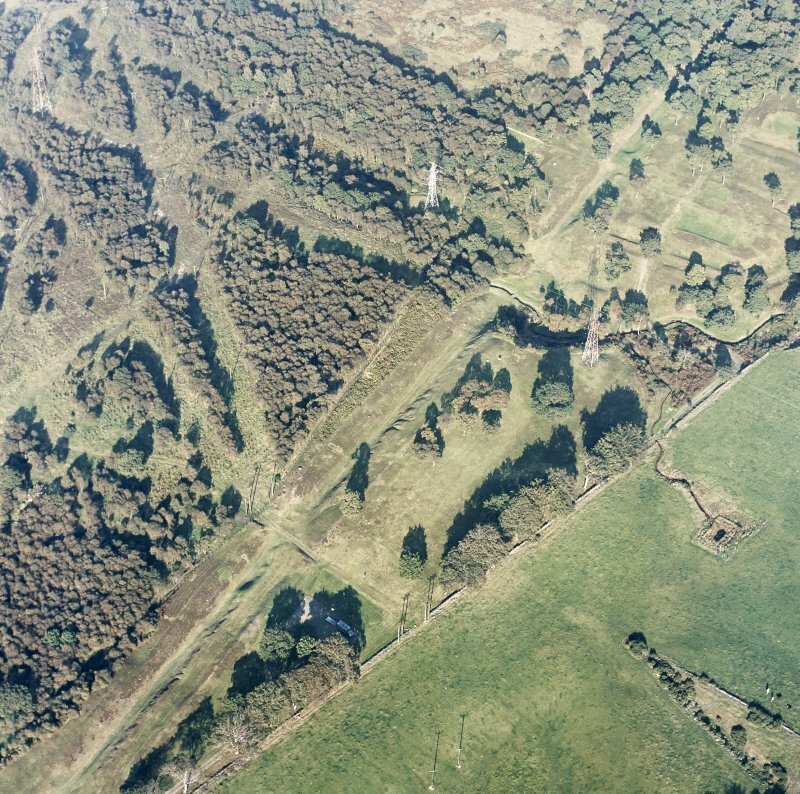 In this section the Military Way lies beneath the modern track, but its course is marked by a series of quarry-pits visible between the rear of the Wall and the track; these pits were dug to provide gravel for the Roman causeway. Finds from the fort are preserved in the Royal Museum of Scotland, Queen Street, Edinburgh. NS 8261 7934. 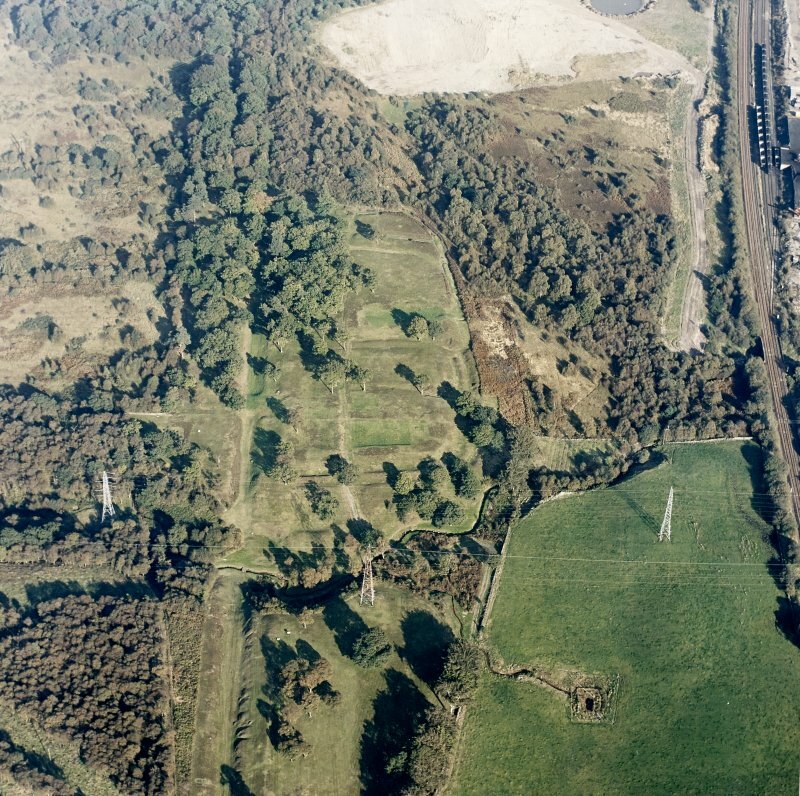 Archaeological monitoring was undertaken on 11 July 1995 of the cutting of the foundations of a dismantled electricity tower which had stood within this camp. 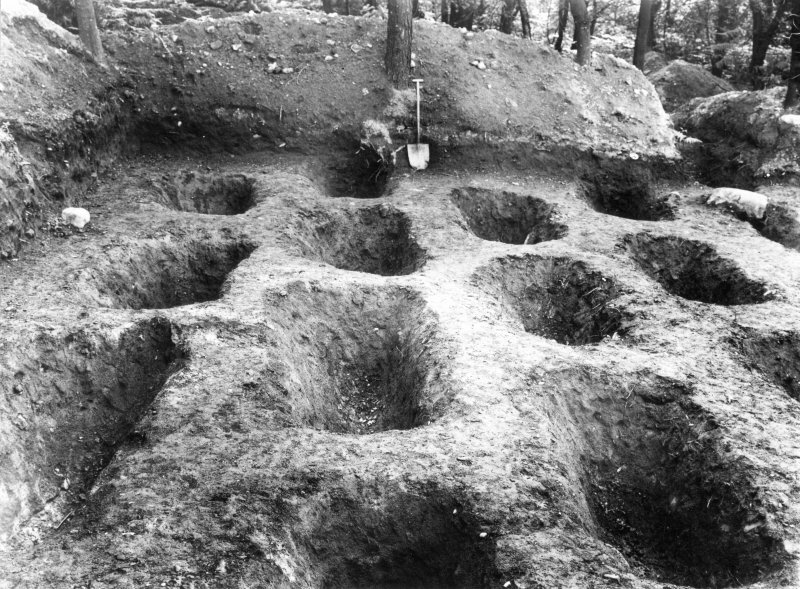 Four small trenches c. 0.8m by 0.8m in area were excavated by hand around each leg foundation, and the tower foundations cut. Evidence of a buried ploughsoil was identified in the NW trench at a depth of 0.3m, but elsewhere all excavated material appeared to comprise disturbed backfill associated with the erection and/or maintenance of the tower. 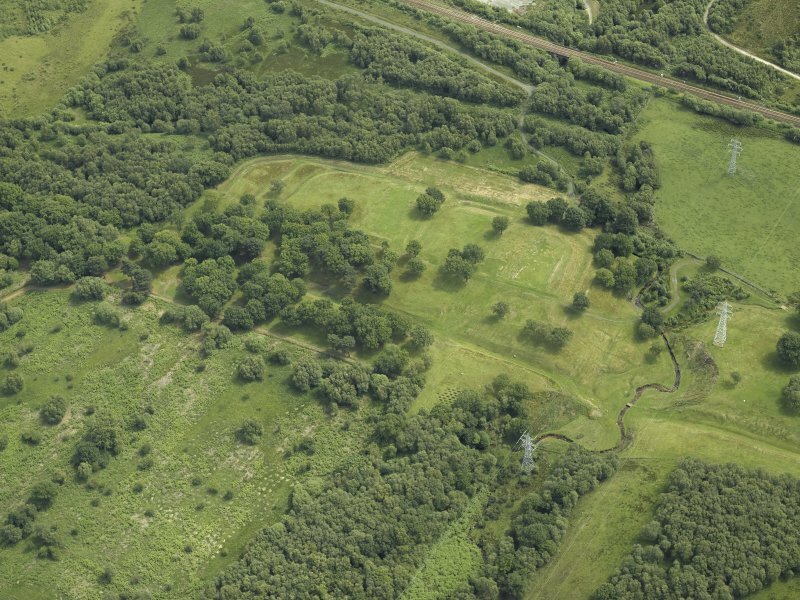 No remains associated with the Roman temporary camp were identified. 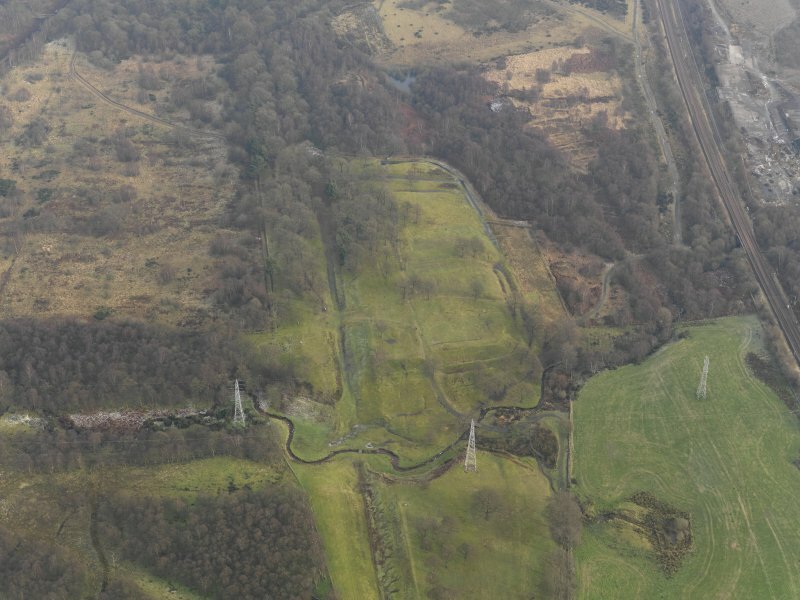 Adherence to a Methods Statement for the removal of the tower, agreed in advance between Historic Scotland and Scottish Power, ensured that no damage occurred to the site. Full details are lodged with the NMRS. NS 841 798 (approximate centre of fort) and NS 844 798 (approximate centre of field system). Over the Fort complex, good correlation has been found between the geophysical datasets and the features recorded through excavation, aerial photography and documentary research. 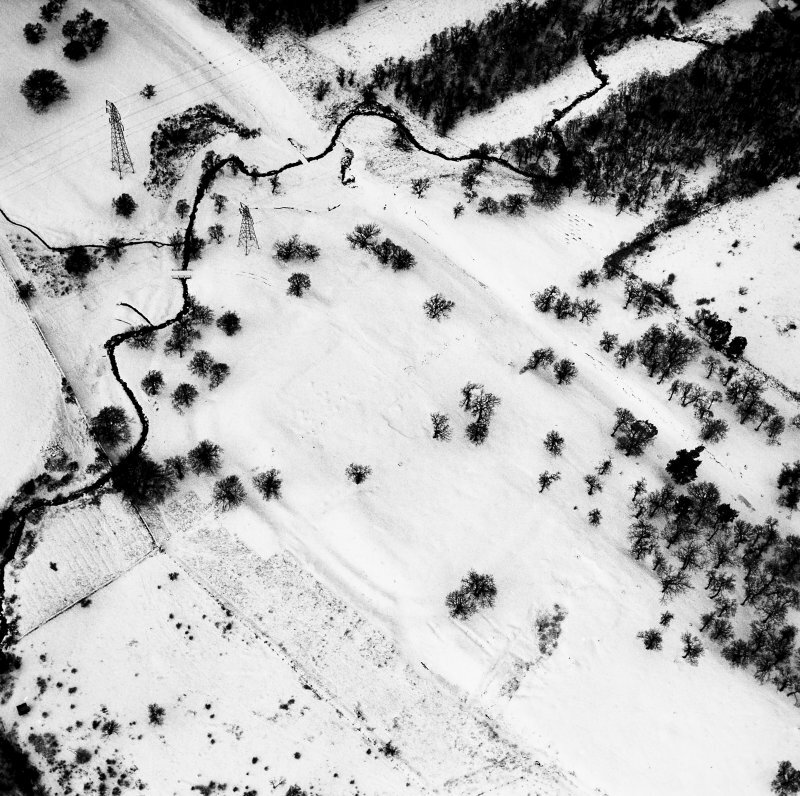 However, given the relatively extensive investigations carried out since the turn of the 20th century, limited additional archaeological information has been gleaned from the geophysics. The results indicate a general lack of geophysical evidence for further Lilia ever having been dug, though it remains debatable whether such features would produce detectable geophysical anomalies. On a more positive note the present survey has identified a possible workshop in the Annexe along with other structures, possibly timber-framed. 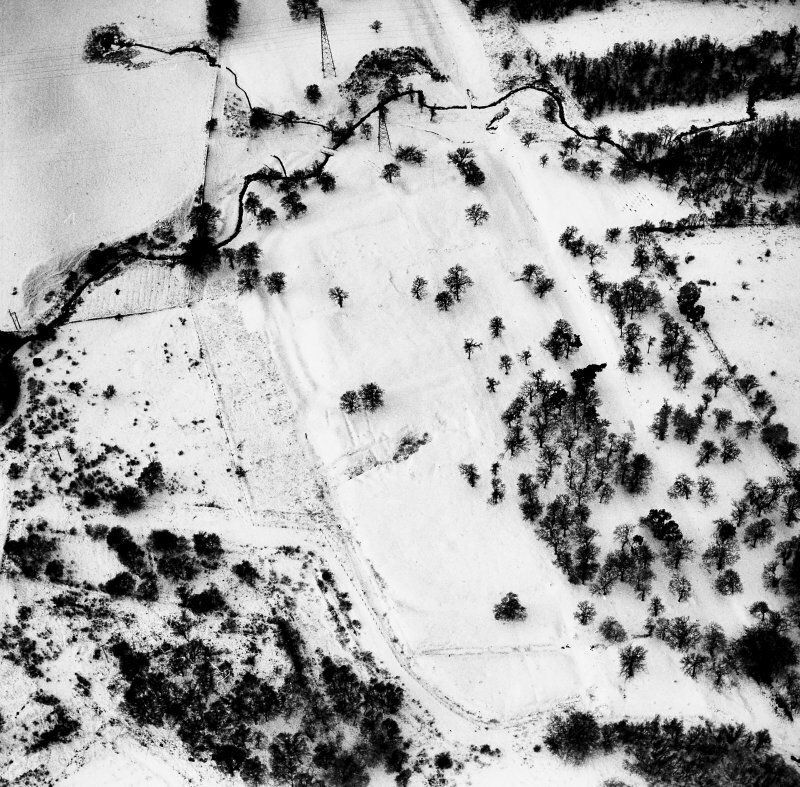 The Military Way, often difficult to locate geophysically, has been clearly detected running through the Fort. 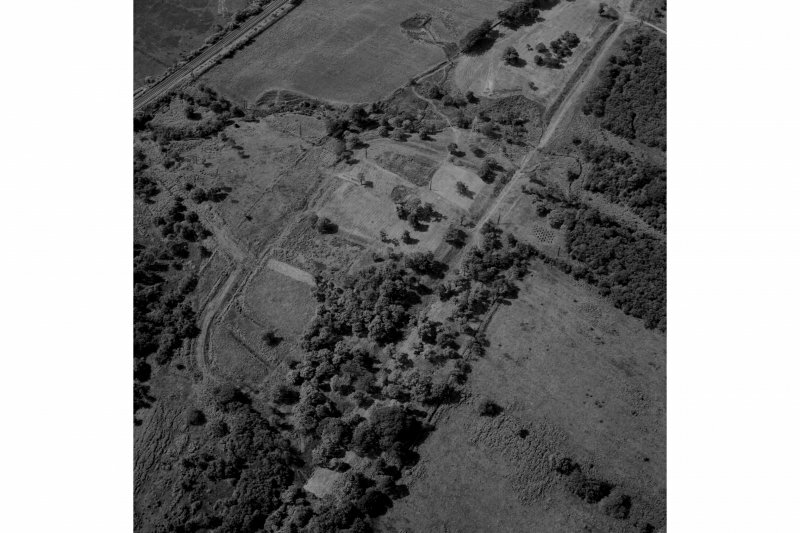 However, to the southeast, in the vicinity of the field system, little of definite archaeological potential was found; the majority of responses were likely to be natural in origin and the results did not help to resolve the function of the features. NS 8431 7991 (centred on) Four test trenches were excavated, 16–18 February 2011, to ascertain the extent of the current drainage scheme and to characterise the extent of the in situ remains of the Roman ditch. 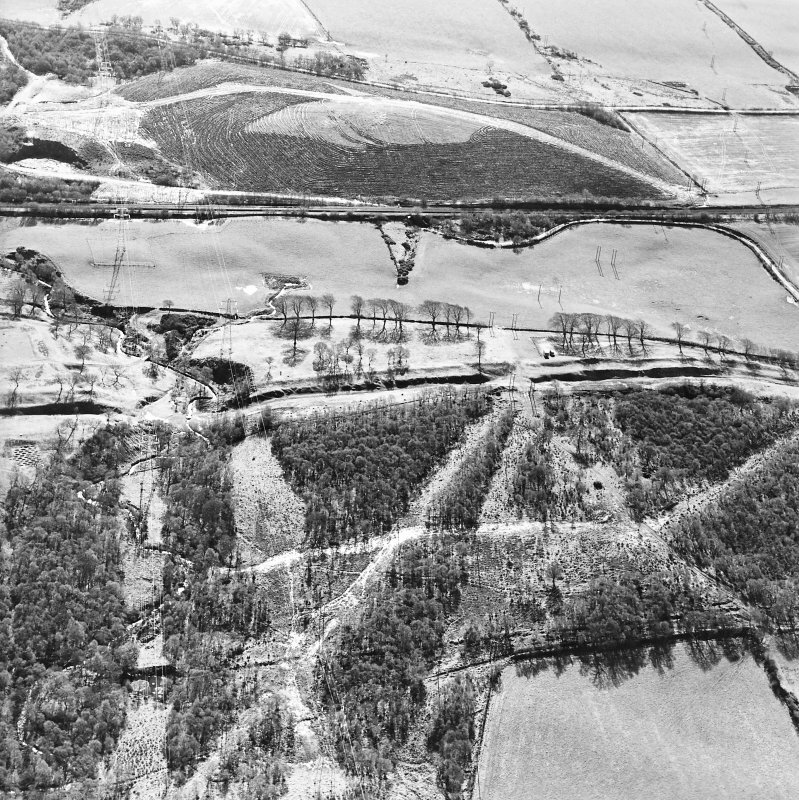 The trenches revealed that a number of changes had been made to the earthwork by the drainage works of the 1960s. 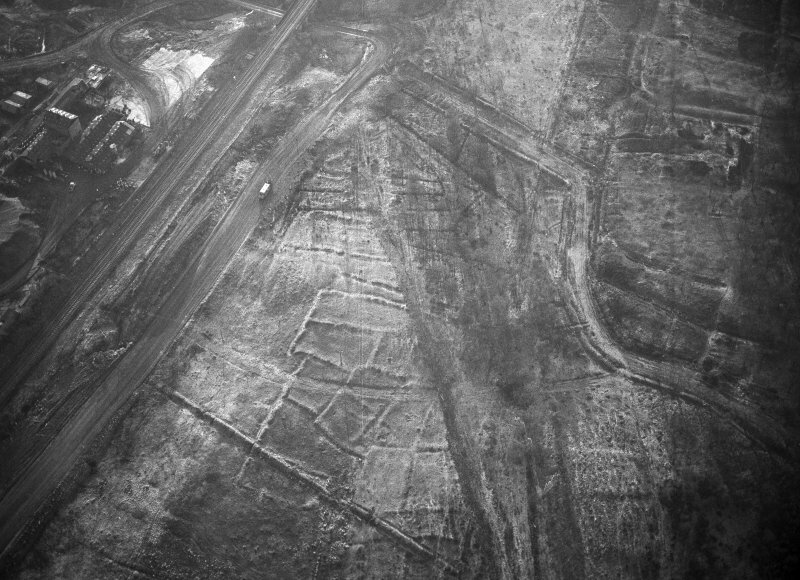 The ditch, originally V-shaped, had been stripped, truncated to the N and S and the central area excavated. The excavated material had been retained and placed over the installed drainage. 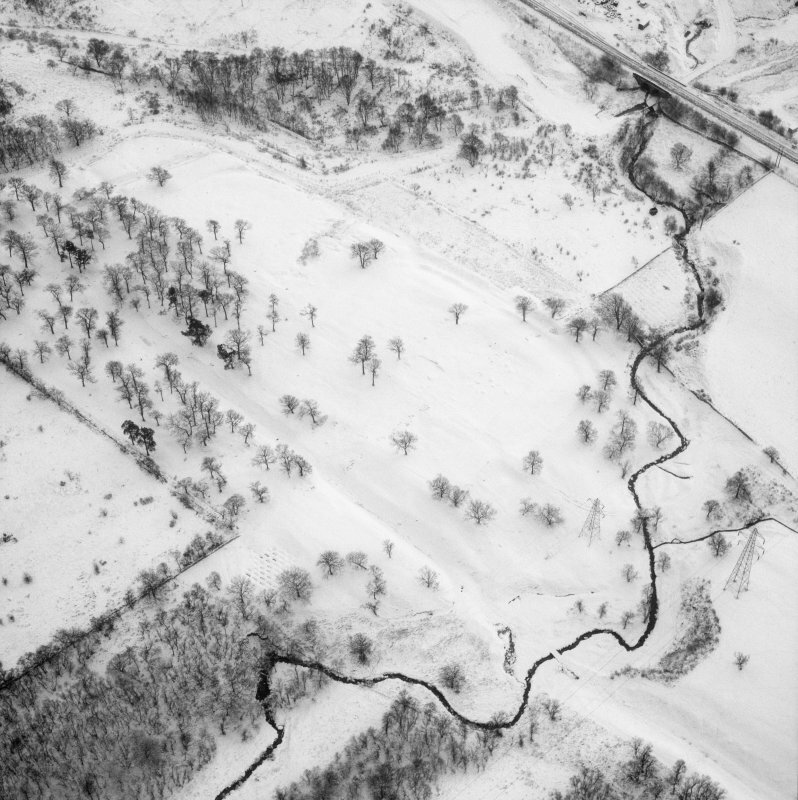 As a result of this work the ditch now has an uncharacteristic flat-bottomed U-shaped profile in this area. NS 8431 7991 (centred on) Further to minor exploratory excavations, a watching brief was undertaken on 23 March 2011, during excavations to install new drains. There were no finds or features of archaeological significance. 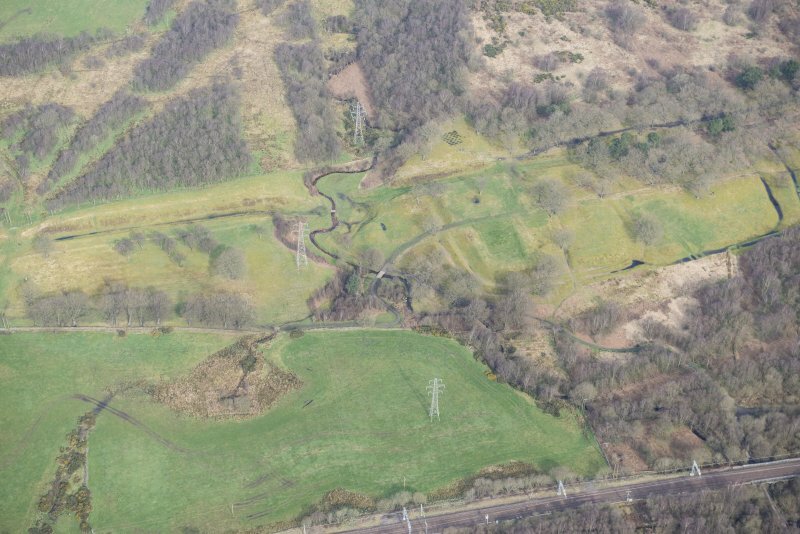 Under the terms of its PIC call-off contract with Historic Scotland, Kirkdale Archaeology was asked to monitor the initial stage of the insertion of a series of fin drains within the Antonine Ditch at Rough Castle. This followed a test trenching exercise in February 2011 which raised the possibility that artefacts could be recovered during the current drain trenching exercise. The purpose of the monitoring was to establish whether it was feasible or practical to carry out a full archaeological watching brief based on the conditions and methodology being employed during the cutting of the drains. 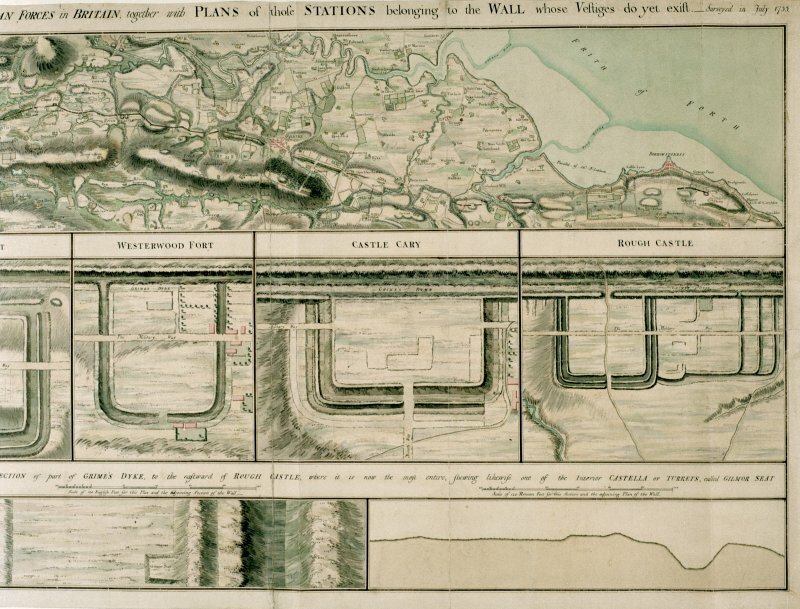 The existing drainage system consisted of a central drain comprising a pipe covered in pebbles and wrapped in a Gore-Tex terram. The terram was effectively preventing water from entering the drain and this was causing water to stand in the ditch. To solve the problem a series of fin drains was cut diagonally from the base of the S ditch slope, deepening towards the central drain. When the fin drain met the central drain, the Gore-Tex terram was cut back to expose the pebble fill within. The fin drain was then filled with washed pebbles (without finings to prevent clogging) so that water could now percolate down the fin drain, into the central channel and away. 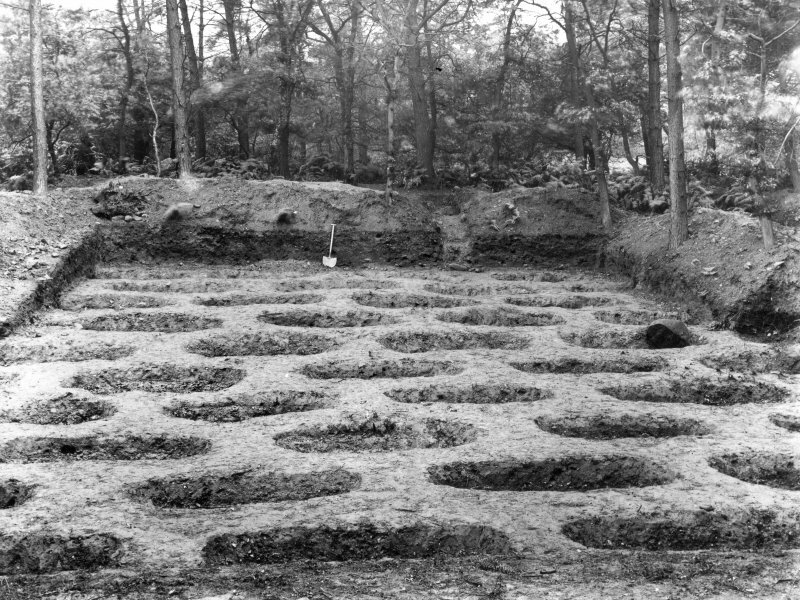 The trenches were manually de-turfed and excavated by a mini-digger. 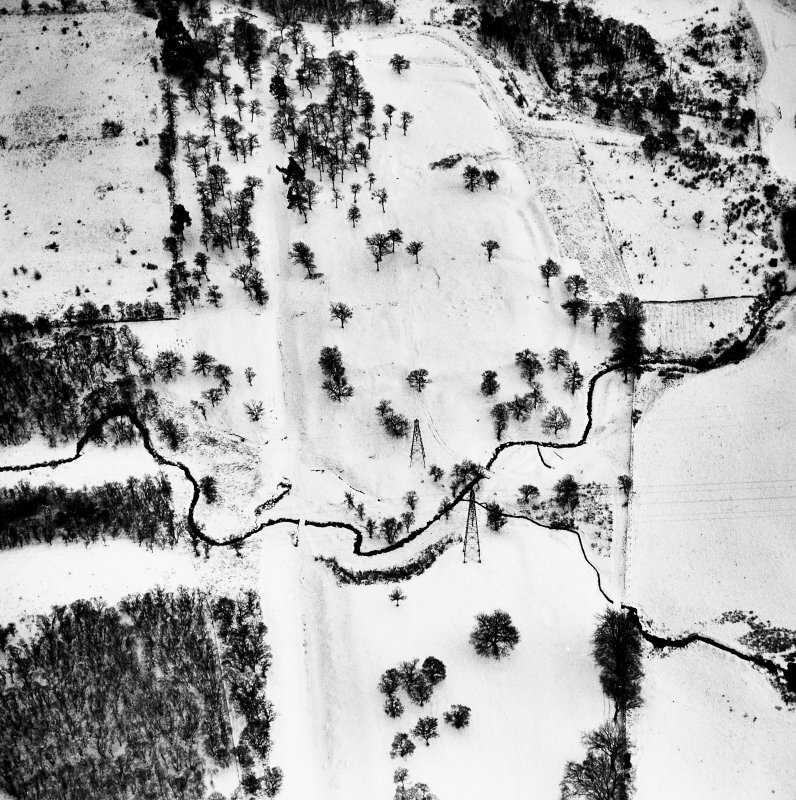 Of the eleven trenches marked out on the W side of the ditch, the first four were monitored until it became apparent that a watching brief during this stage would yield no more information than had been noted during the test trenching in February. 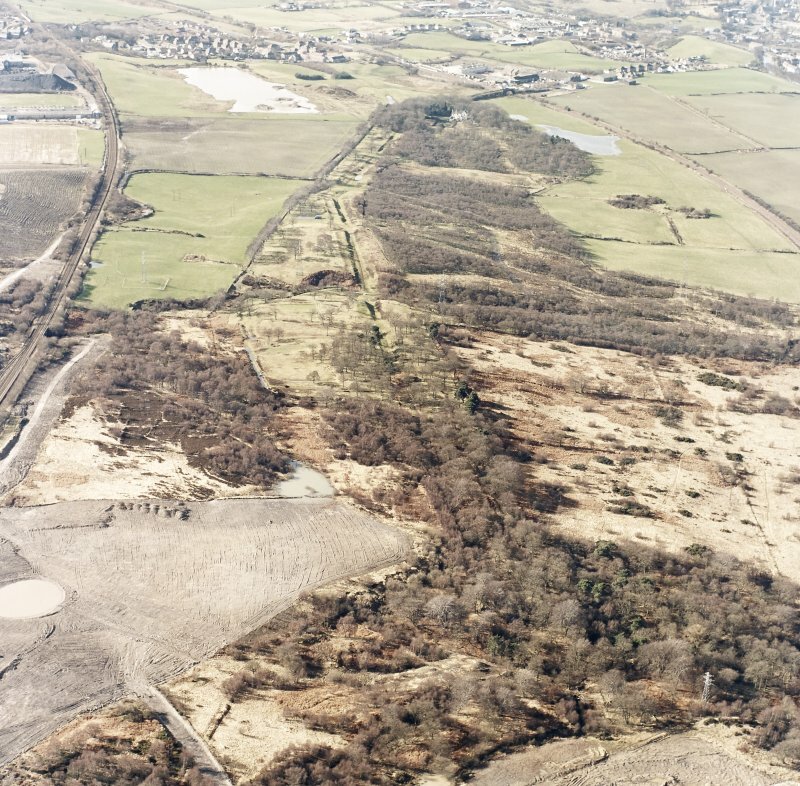 The nature of the machine scrape meant that relatively large volumes of spoil were removed quickly, making the chances of recovering any artefacts extremely unlikely. This, coupled with the fact that the ground had been disturbed during drainage installation work in the 1960s, as well as during more recent drainage works, suggested that an archaeological watching brief was not required. 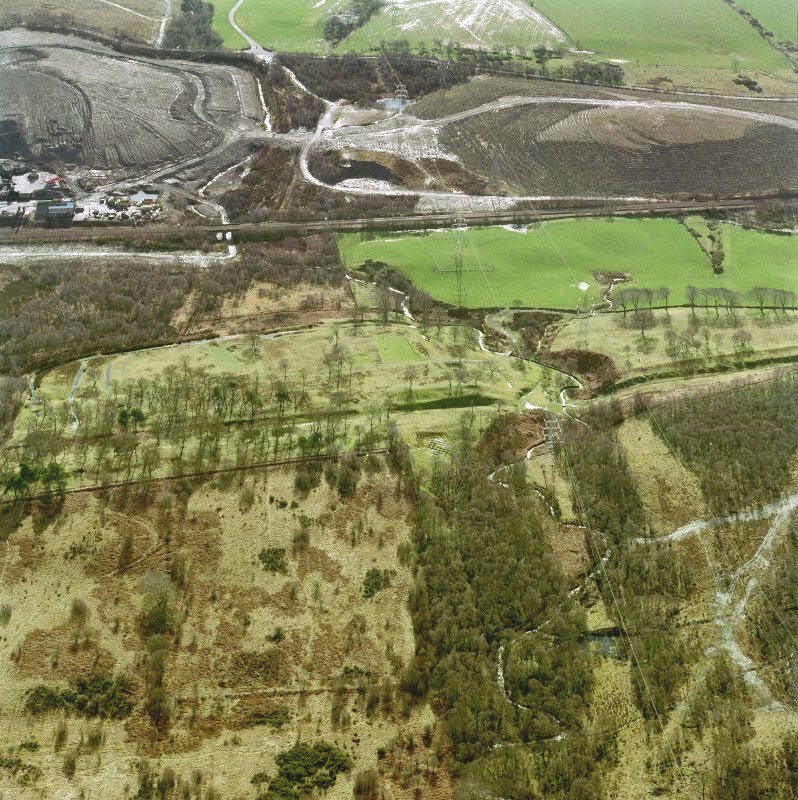 The initial trenches were cut and monitored on 23rd March 2011.